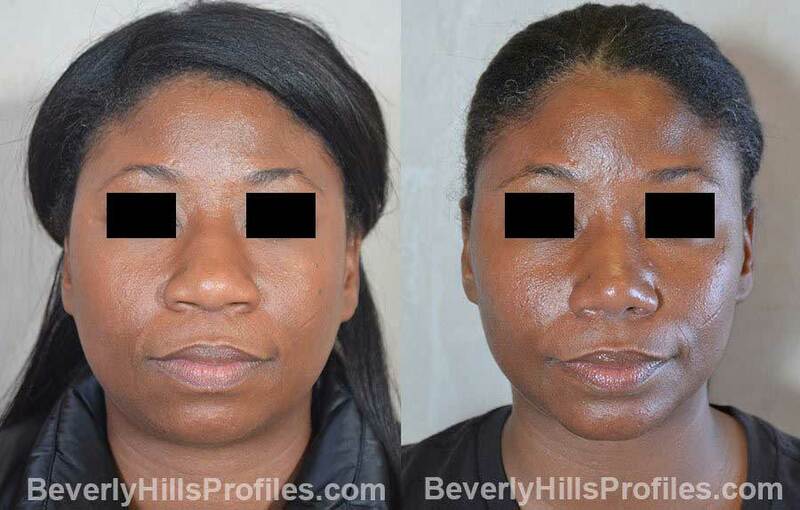 Some might think that this patient had had previous rhinoplasty with tip collapse, but she did not. Occasionally, the shape of the tip cartilages is very vertically-oriented, causing a deep groove in the nostril. She felt this, along with her marked tip crookedness, drew unwanted attention to her nose. Now, her nose is smaller, smoother, more defined, and just blends with the rest of her face. A curvature and droopy tip brings undue focus to this young man’s nose. Although there is still some swelling in these early post-operative photos, we can already see a nose that is now straight, has a smooth profile and no longer droops. A sense of length is preserved to match his oval face. More than that, because of these positive changes, he also looks younger. Case 2: Correction of his broken nose and improved breathing were major goals for this young man. At the same time, he wanted to reduce his nasal hump and deproject his tip. He is extremely happy that his new nose looks good, fits his face, and still maintains a strong, masculine look. Case 3: A curvature and droopy tip brings undue focus to this young man’s nose. Although there is still some swelling in these early post-operative photos, we can already see a nose that is now straight, has a smooth profile and no longer droops. A sense of length is preserved to match his oval face. More than that, because of these positive changes, he also looks younger. Case 4: Some might think that this patient had had previous rhinoplasty with tip collapse, but she did not. Occasionally, the shape of the tip cartilages is very vertically-oriented, causing a deep groove in the nostril. She felt this, along with her marked tip crookedness, drew unwanted attention to her nose. Now, her nose is smaller, smoother, more defined, and just blends with the rest of her face. 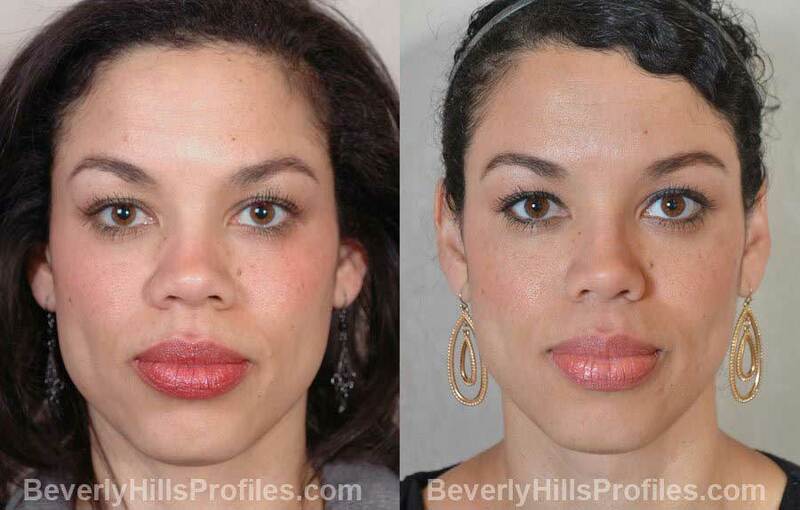 Case 6: This young African American lady presented with the goal of achieving a smaller, more refined front view as well as lengthening of the profile. Her base and front view show significant but ethnically appropriate reduction of her nostrils, and the profile shows correction of the overly rotate, shortened nose. 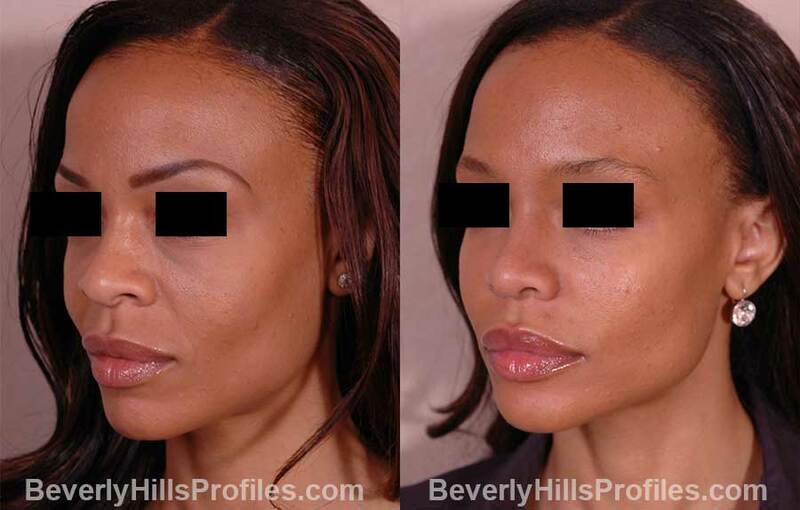 Case 7: This beautiful young lady is a great example of true finesse rhinoplasty. You will notice a subtle, but very real refinement of the tip along with reduction of her nostrils, that otherwise preserves her already great profile. Case 8: This young, African American lady had a beautiful result. On front view, her tip is much more refined and her nostrils have been reduced but are still ethnically appropriate. On side view, she now has a softer, more feminine profile. Case 9: This young woman’s main concerns with her nose were her bump and nasal projection along with a boxy tip. She wanted her nose to project a softer look and take a less prominent role. All of these issues were addressed with rhinoplasty while spreader grafts helped to make sure her airway and breathing was well supported. Case 10: In this patient, a little height throughout the bridge gave the sense of a downturned tip. Hump reduction was combined with tip narrowing to bring an overall balance to the nose. At the same time, a conservative otoplasty was performed to set back somewhat prominent ears. Case 11: This patient wanted to address her dorsal convexity and her tip which she felt was bulbous, overprojected, and slightly downturned. She preferred a straight profile which, along with some tip definition, preserved a more elegant bridge line. 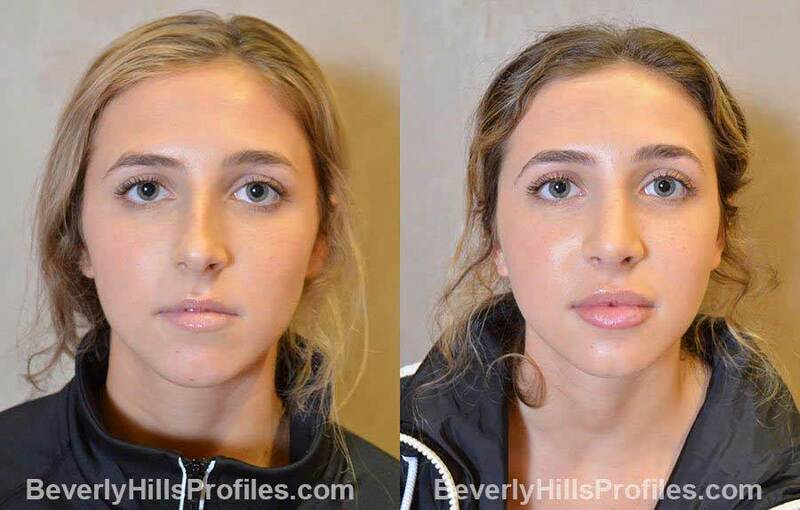 Case 12: One of the things that we love about rhinoplasty is that we can combine dramatic changes such as straightening this patient’s nasal twist, and at the same time create some subtle enhancements such as refining and slightly deprojecting the tip while reducing the sense of columellar show. At 6 months, her nose now balances with her face and really brings out her beautiful eyes. Case 13: This patient felt like her nose dominated her face and was out of place with her other features. The challenge is to achieve substantial reduction in size on a background of thick skin while creating a naturally refined appearance. Now, her eyes really stand out in the photos and her nose is removed as the dominant feature of her face. Case 14: A prominent nasal hump and droopy tip can contribute to an unintended and unwanted look of severity. In this case, correction of these concerns along with deprojection and straightening has led to a really beautiful new look. 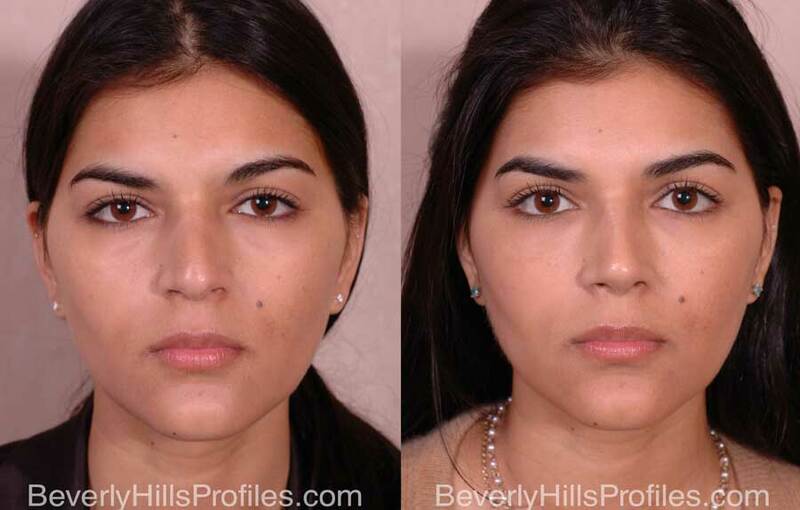 Case 15: Creating beauty is about harmonizing facial features and that is our ultimate goal in rhinoplasty. This already beautiful woman was made more so by reducing her hump and softening her boxy tip. And, at 6 months, her improved sense of definition is going to get better yet. Case 16: A crooked and overprojected nose draws the eye away from other beautiful features. 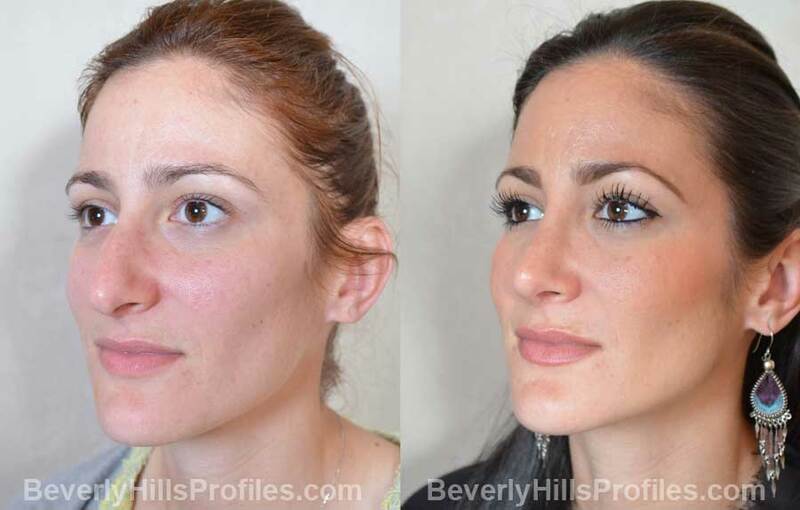 In this pretty young woman, you can see how rhinoplasty transforms her face. Even at this early 3-month point, we see that her nose is more feminine and no longer dominates her otherwise delicate features. And, at the same time, it is balanced and ethnically-appropriate. Case 17: This young woman felt her tip was too bulbous and bottom-heavy, and she was looking for significant refinement. 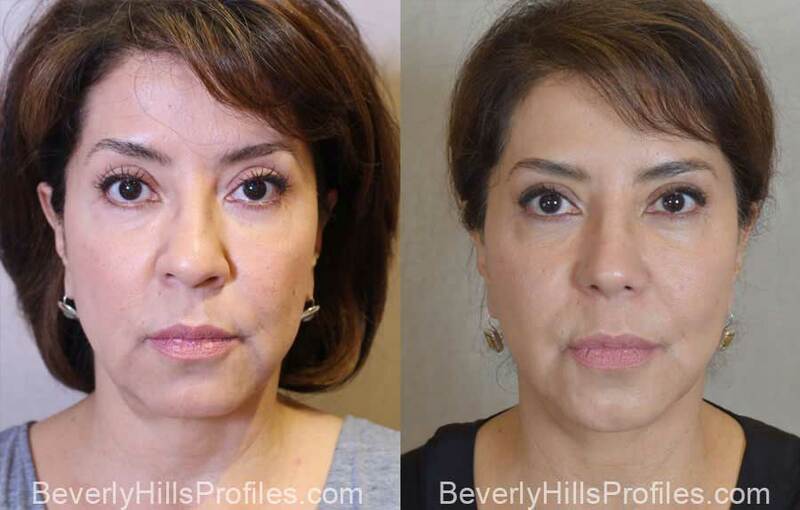 A combination of tip narrowing and shortening of her nose along with deprojection and straightening brought her nose into harmonious balance with her other beautiful features, creating a truly transformative change. Case 18: This procedure was done to correct a broken nose and deviated septum. Along with correction of breathing concerns, hump reduction and correction of a droopy tip was performed to successfully achieve some simultaneous cosmetic goals. Case 19: This handsome, young gentleman is a great example of true tip deprojection. Preoperatively, he had an overly projected, droopy tip and bump. Postoperatively, you note his tip has been deprojected and the bump is gone, and he maintains a strong profile. 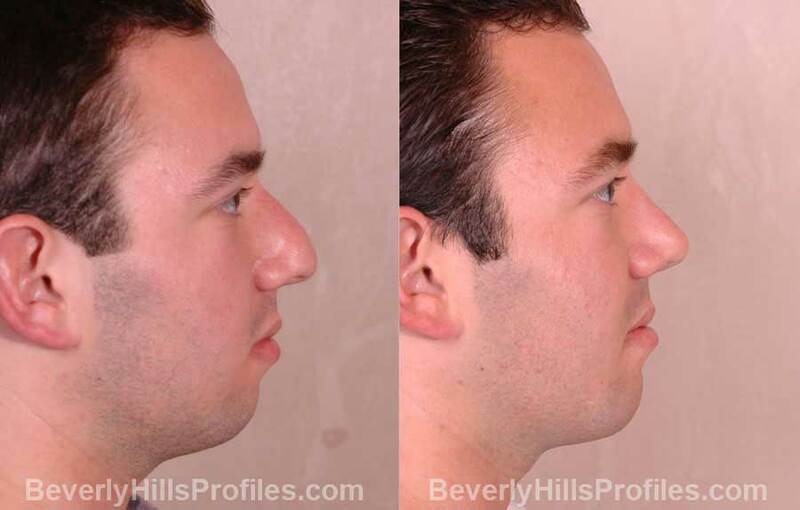 Case 20: Keeping a strong and masculine profile is critical in male rhinoplasty. 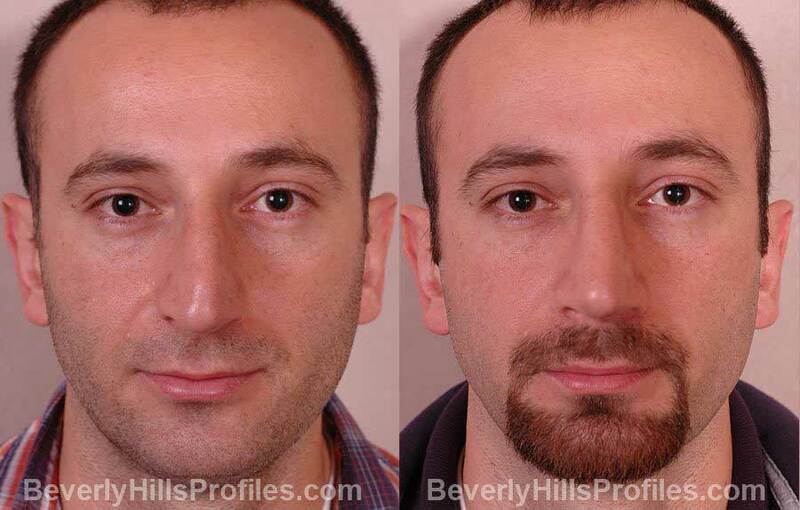 This young man wanted his nose straightened with correction of his droopy, projected tip. At Profiles, we pride ourselves in achieving these goals while preserving his strong sense of identity. 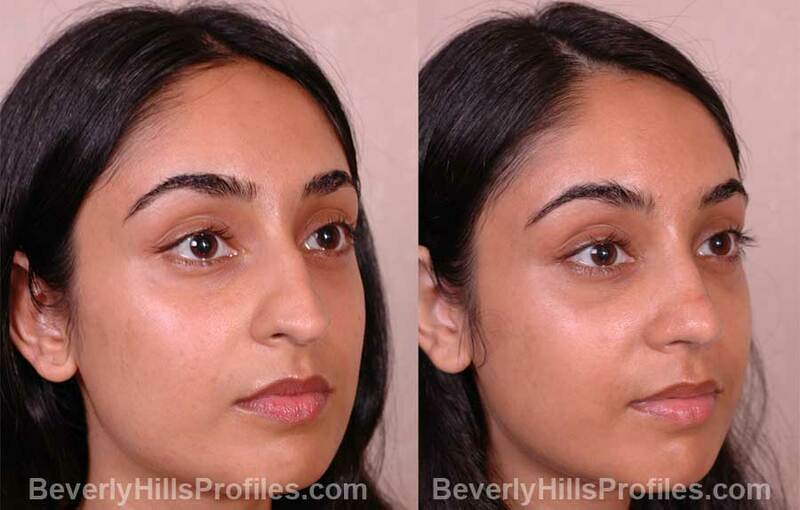 Case 21: For our patients who are in image-centered occupations such as modeling or acting, nasal refinements often focus on small changes that will enhance the overall look and remove subtle cues about the nose that preoccupy or distract the eye. This successful model had a look that really worked for her but had always felt that her tip and nostrils were too wide, flared, and slightly droopy. Creation of a slightly narrower and more structured tip draws unwanted attention away from her nose and, instead, enhances her overall look. 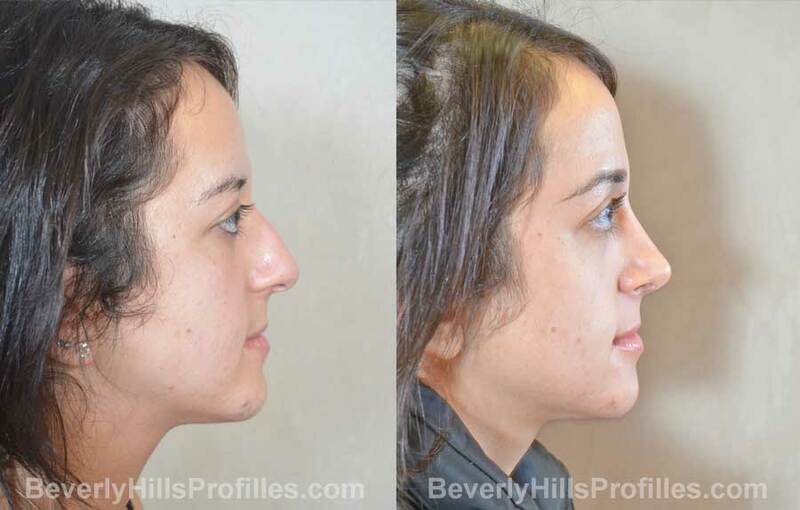 Case 22: This young woman was happy with her profile but wanted to reduce nasal width, tip boxiness, and nostril flare on front and three-quarter views. 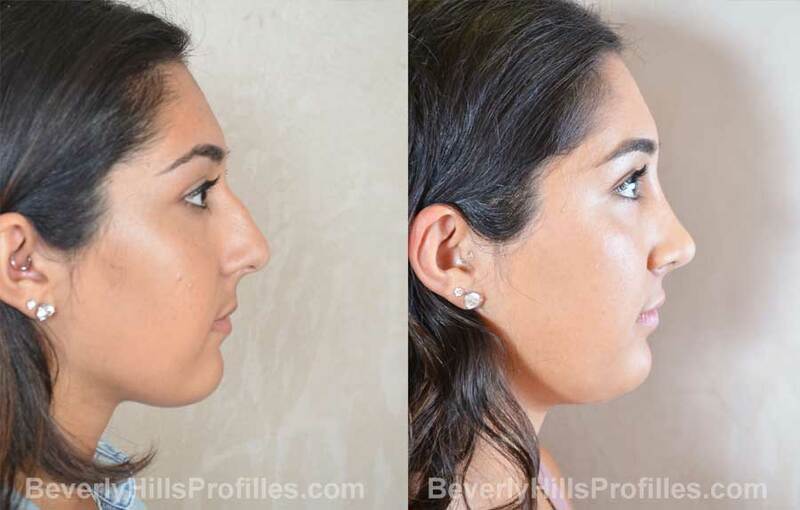 The combination of narrowing her bridge, tip refinement, and nostril reduction helped bring her nose into balance. 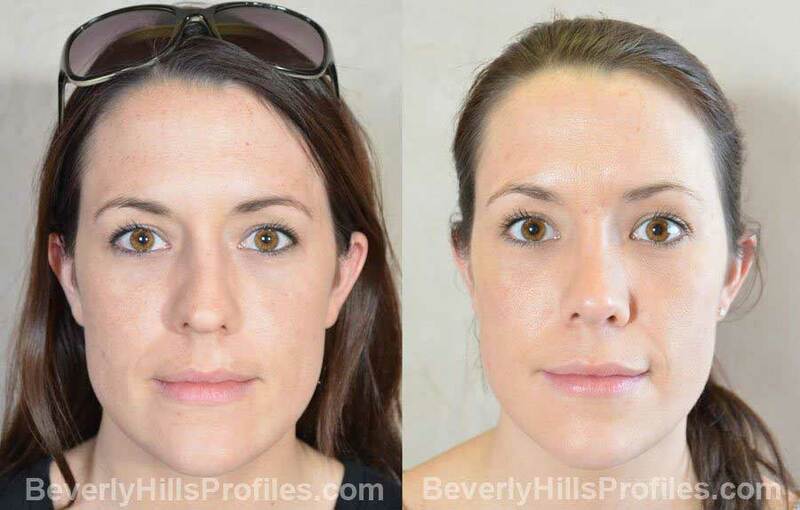 At the same time, fat transfer to the under eye hollows did a fantastic job of brightening her eyes and giving her a more youthful look. Case 23: Very pretty features can be thrown off by a nose that is even slightly crooked or disproportionate. 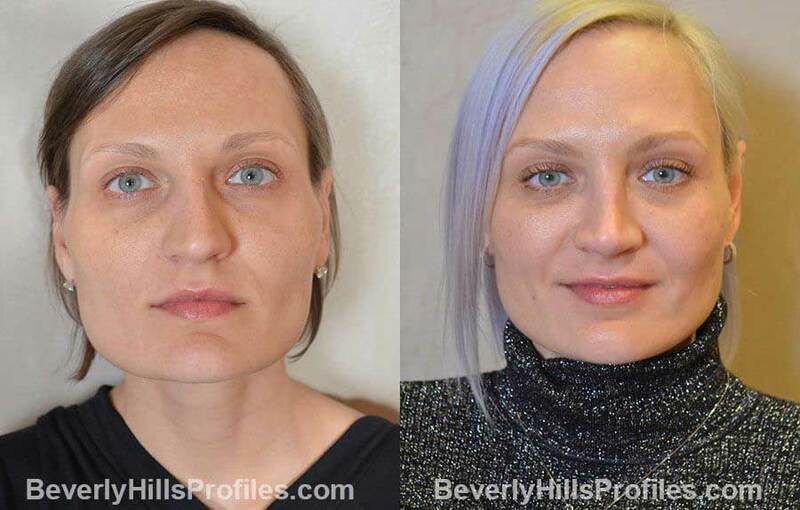 This woman provides a beautiful example of how subtle enhancements such as straightening and correction of tip fullness and droop can produce a stunning, transformative result. Case 24: This patient had a broken nose with an S-shaped curvature and rounded, slightly droopy tip. She is still a little swollen in these photos, but you can already see significant straightening along with resolution of her nasal hump. Improvement in tip refinement and position helps to round out the overall result. Case 25: This patient had what is called a tension nose wherein a convexity on the bridge pushes the tip forward and down. Notice how this also puts tension on the upper lip and appears to tether it from inside. a combination of straightening, improving breathing, removing the hump, and setting the tip appropriately also helps to relax the upper lip and complete the look. Case 26: Narrowing a wide tip can really soften the face. The challenge in Ethnic rhinoplasty is in making a nose smaller while still maintaining good structure and support so that definition is enhanced. 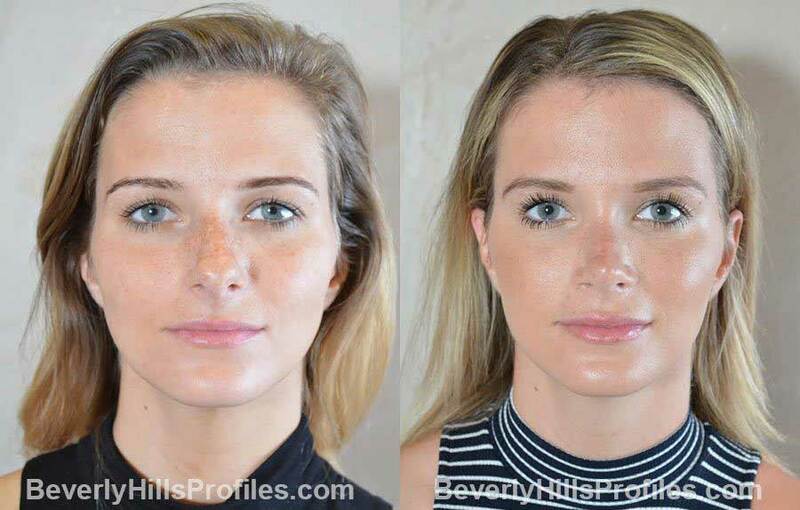 In these 15-month photos, you can now see how tip narrowing along with reduction of the bridge convexity has created a very pretty, feminine nose that enhances her beauty. 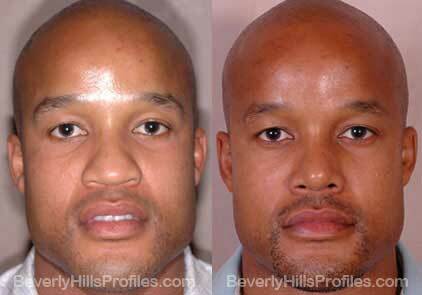 Case 27: This is a great example of a reduction rhinoplasty to correct an over-projected nose. Her nose looks balanced and refined but still completely ethnically appropriate and natural. Case 28: This beautiful, young lady is a great example of a truly transformative result. 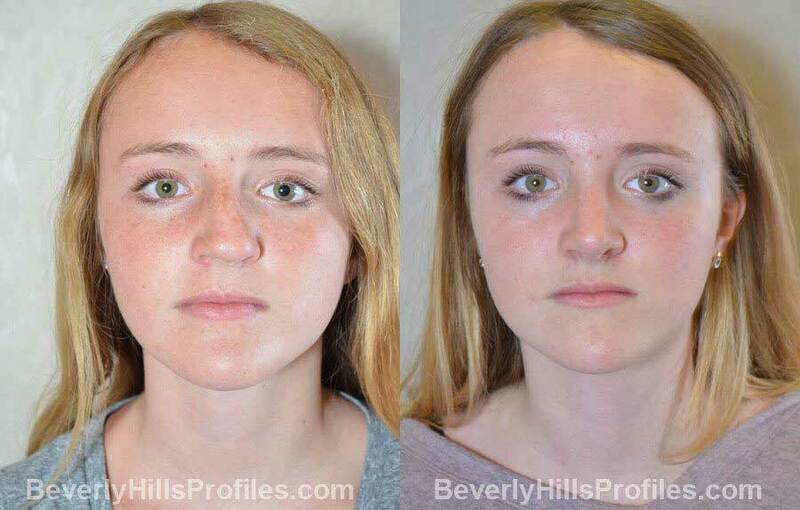 Postoperatively, her nose is more refined; the bump and droopy, slightly over projected tip have been transformed to a balanced fantastic result and very confident young lady. Case 29: Major concerns for this patient were widening of the tip with a marked lack of projection which made his nose feel flat and washed out. Nostril thickness and rounding was also something he wanted addressed. In this case, irradiated donor rib cartilage was used to project and support the tip along with alar base reduction removing a significant amount of nostril flare to create a natural tip and nostril contour that is ethnically appropriate. 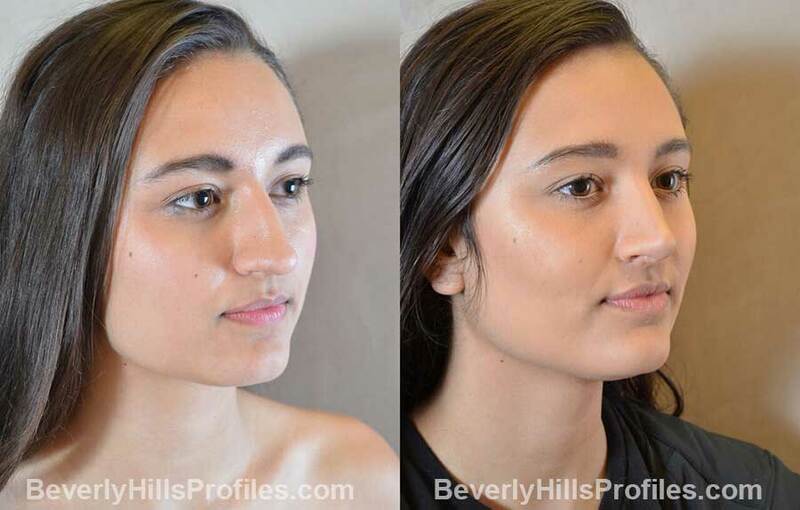 Fat transfer to the cheeks helps to balance out his flat mid-face to strengthen the cheek contour which can be seen nicely on the profile view. 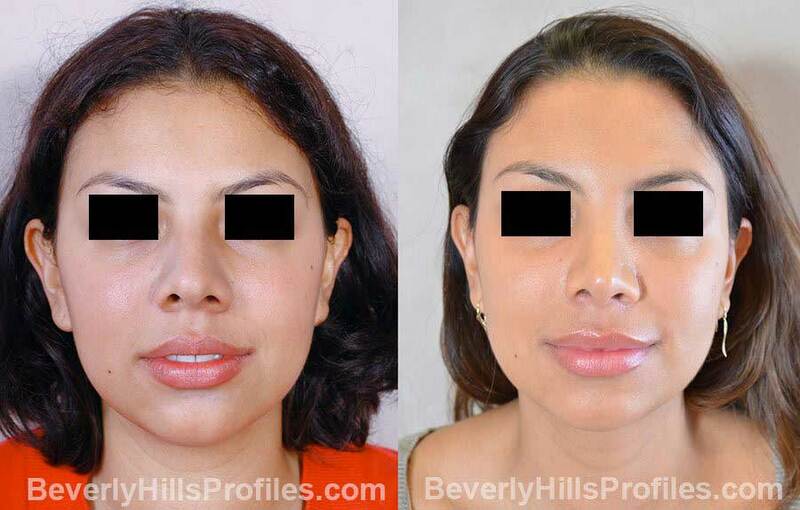 Case 30: The goal here was to enhance overall facial proportions by improving the relationship between the nose and chin. 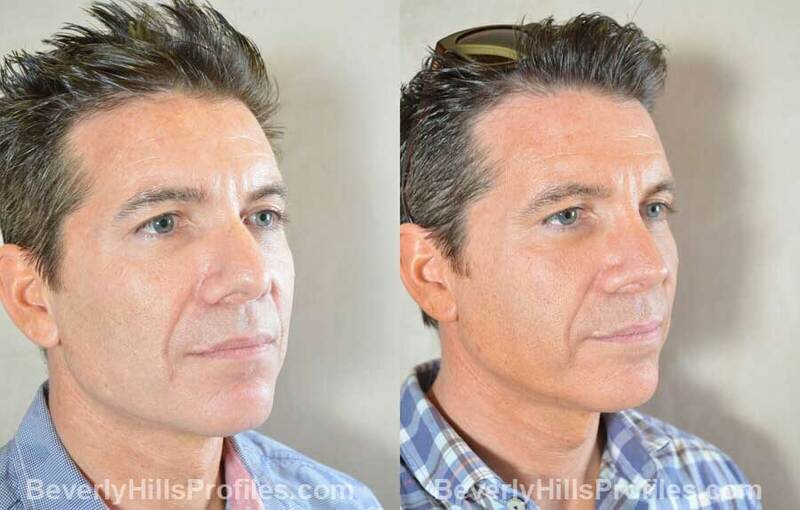 Narrowing of the nose and squaring of the chin on front view combined with hump reduction and projection of the chin on profile view all helps to create a more balanced facial aesthetic while strengthening masculine features. Case 31: This patient had some typical concerns of feeling washed out from the front with flattening and spreading of her tip. She was very happy with the narrowing and definition achieved for her bridge and tip along with nostril reduction. 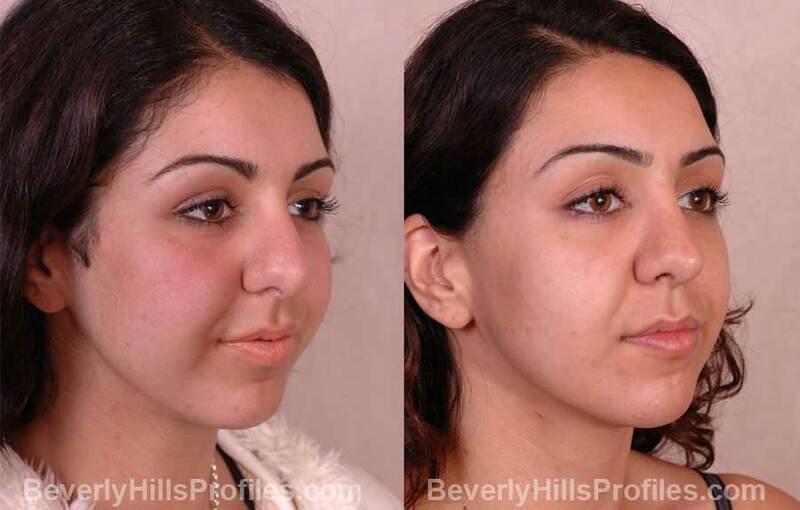 In addition, chin augmentation increased chin projection to improve the balance of her lower face and jawline. Case 32: A boxy, bulbous tip, nasal hump, and excessive length can allow the nose to overtake this patient’s otherwise feminine features. Correction of these concerns creates a truly dramatic change while still looking completely natural for her. Case 33: For this young woman, the nose felt boxy and unrefined in comparison to her more defined facial features. 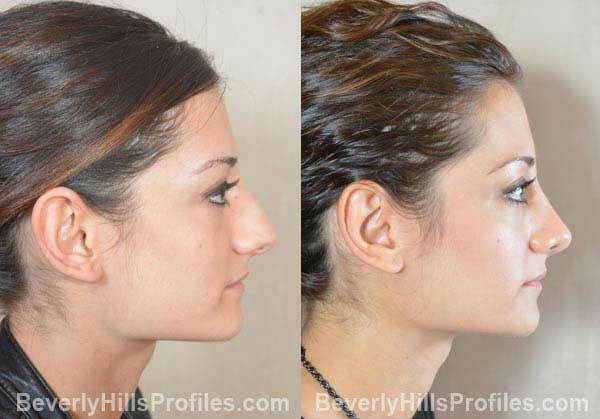 Goals of rhinoplasty included lifting and definition of the tip along with subtle hump reduction to create a more sleek and streamlined nasal contour. Achievement of these goals creates a nose that harmonizes rather than dominating other features. Case 34: Hispanic Rhinoplasty in this patient meant removal of a high dorsal bump on profile and correction of a droopy-appearing tip. On front view, there is correction of a left nasal bone fracture and refinement of the nasal tip. 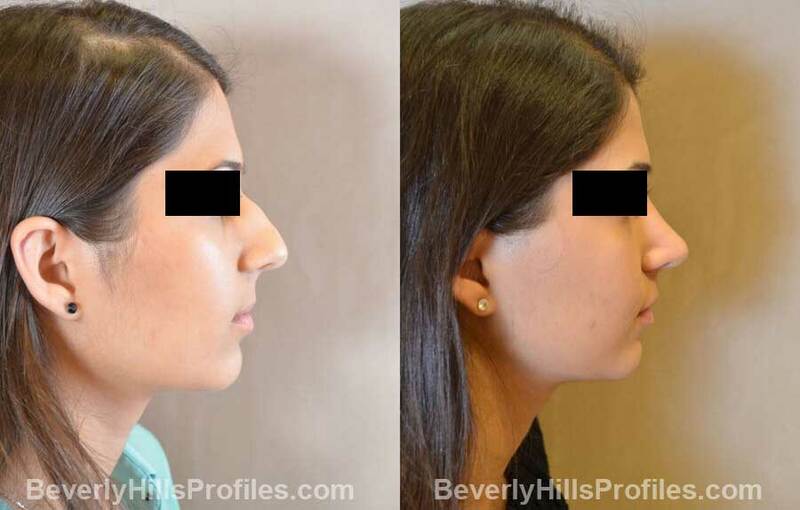 All of this was done while still maintaining her unique individuality and while bearing in mind the various challenges Rhinoplasty in Latino patients present- thicker skin and softer cartilage. Case 35: This young lady presented having fractured her nose as a young child. 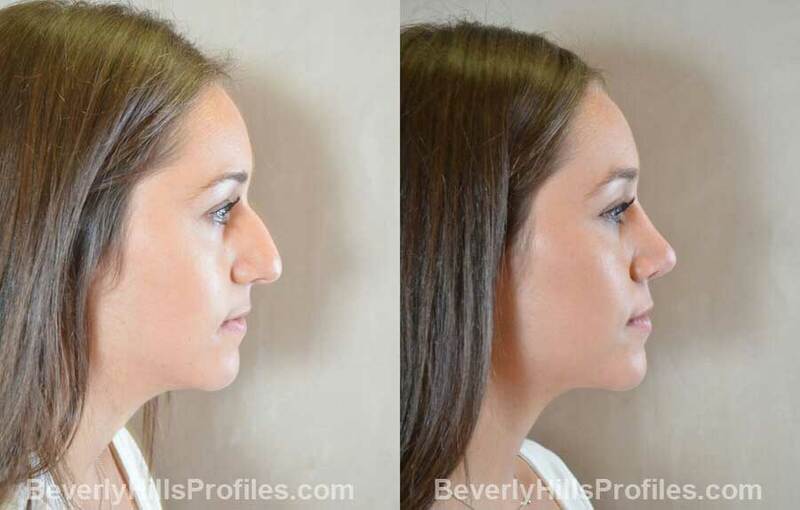 Her surgery resulted not only in significantly improved breathing, but a correction in the twist of her nose as well as refinement of the tip and profile line. Case 36: This patient wanted maximal tip definition and refinement along with lifting of her droopy tip, reduction of a nasal hump, and correction of significant tip assymetry. She is ecstatic with her result. Case 37: Achieving a beautiful, natural change in an already beautiful woman is one of the great challenges we love in rhinoplasty. In front view you see a beautifully defined, natural change that simply looks great. 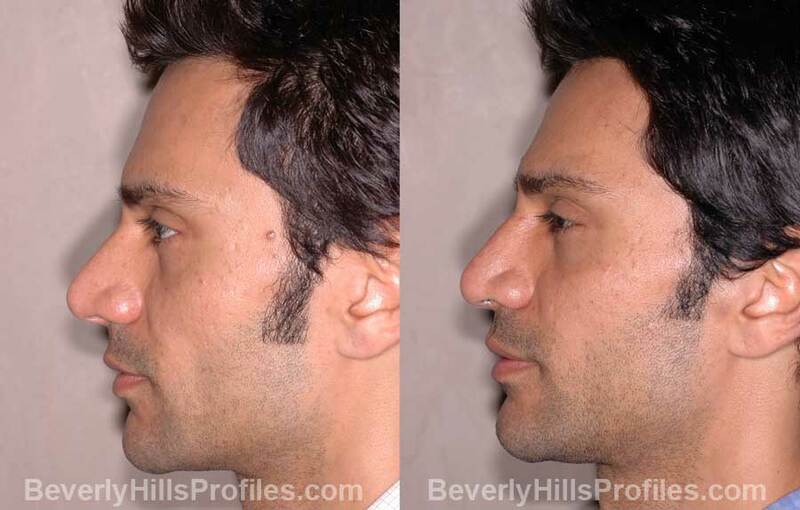 Then on profile and 3/4 views, you see an elegant change where the tip is deprojected (made smaller) but retains a beautiful, natural aesthetic- this is finesse rhinoplasty. 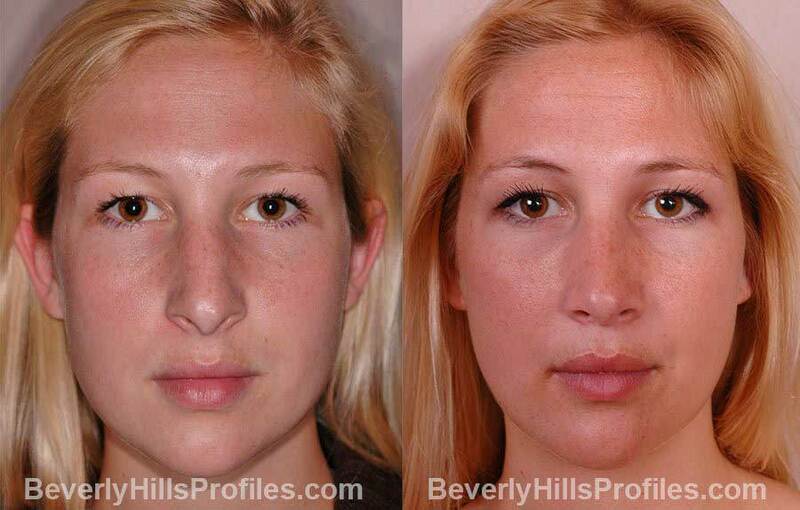 Case 38: This beautiful young lady is an early 6 month example of a finesse rhinoplasty. On front view you can see the bridge is narrower and the sense of hang is improved. On profile, the tip looks undone, natural and less projected with correction of the slight hanging columella. 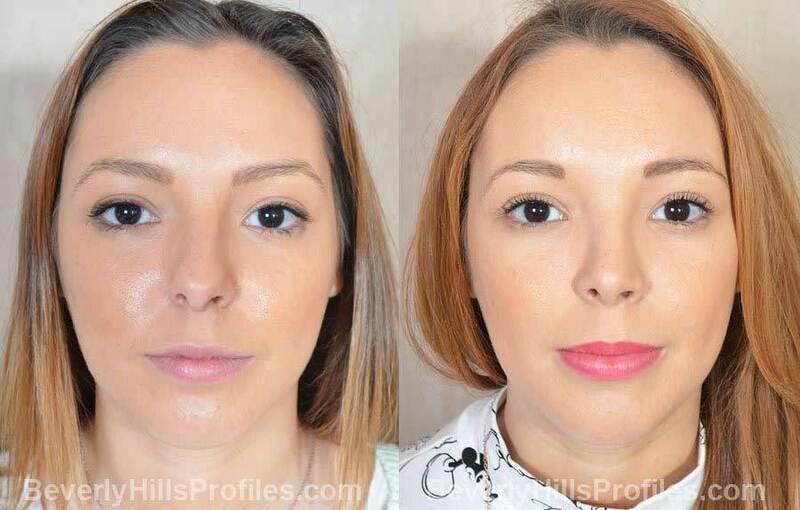 The result is a beautiful, natural look that corrects the issues but leaves her looking totally natural and undone. 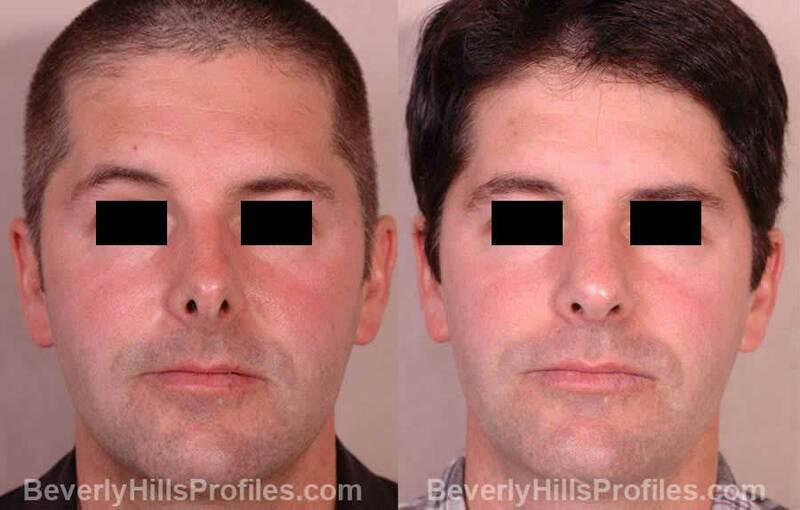 Case 39: The facial plastic surgeons at PROFILES Beverly Hills tailor every Rhinoplasty to achieve just what you are looking for. Sometimes, the most subtle of changes take just as much effort as the most dramatic ones. This pretty model didn’t want to drastically change her look. 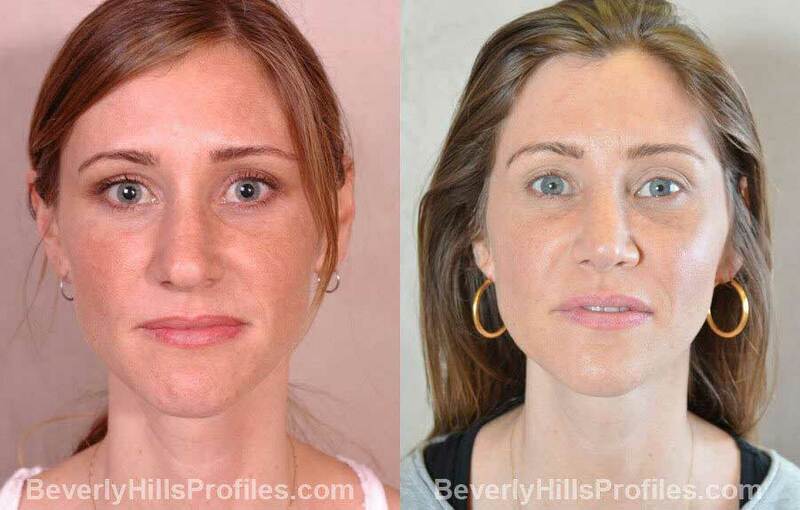 Her Los Angeles Finesse Rhinoplasty gave her the refinement she wanted, especially on her front and three-quarter views. Along with fat transfer to the lower eye area, her overall look was softened to make her that much more camera ready. 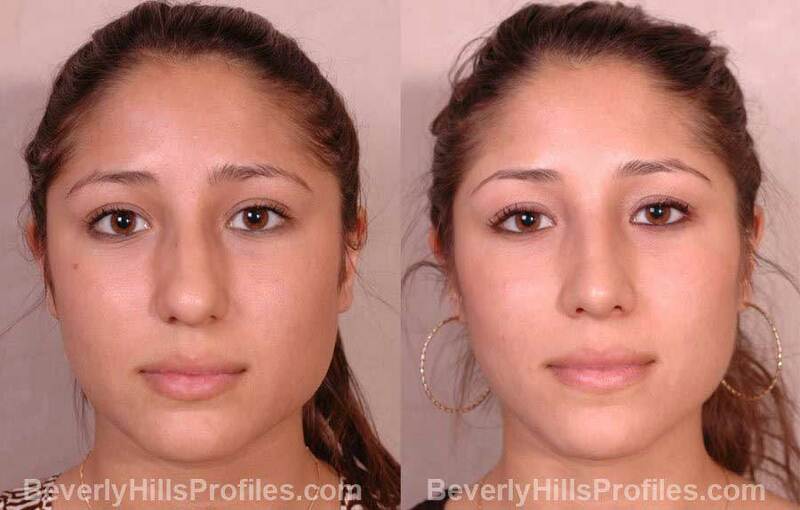 Case 40: Excessive nasal width can cause the nose to dominate other fine, delicate facial features. In Ethnic Rhinoplasty, the key to obtaining a more refined nose is to create a nasal framework upon which the thick skin will wrap around. 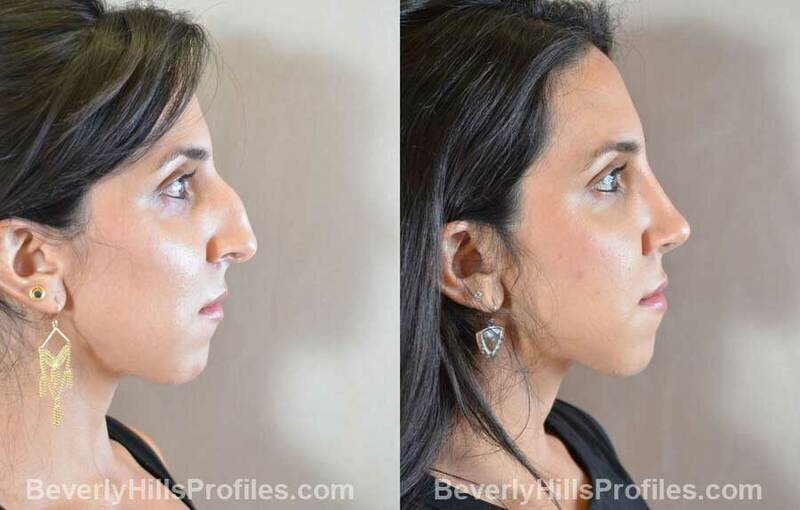 This pretty young Persian woman wanted to reduce her nasal width, the fullness in her tip, and the sense that her tip was downturned. 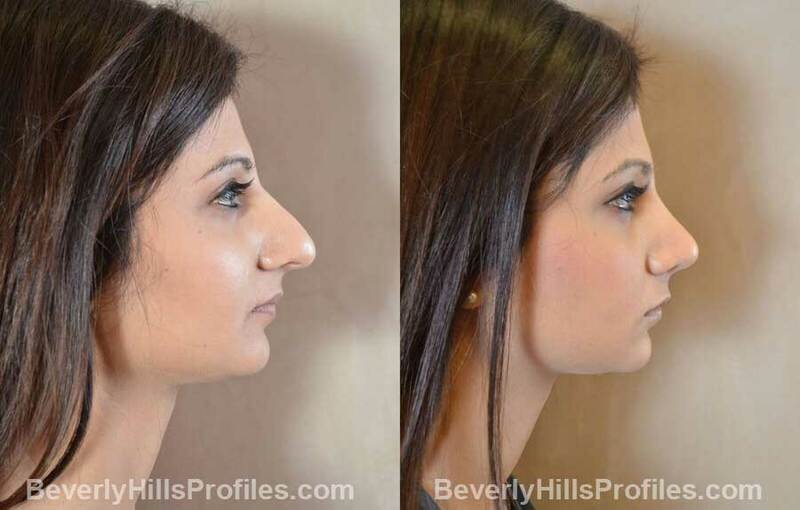 These six month photos show significant improvements in achieving these goals and her nose will only get better yet. Case 41: For this young man, projection and over-rotation of his nose had always made him feel that his nose was too short and upturned. 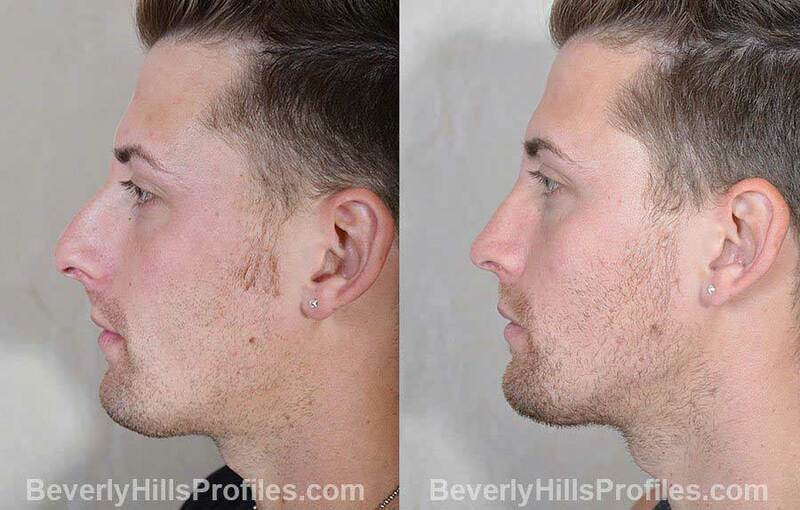 Rhinoplasty focused on deprojecting and lengthening his nose to reduce nostril show and give him a more natural nasal harmony. Case 42: Crooked noses can be one of the hardest things to correct in Rhinoplasty, especially if there has been significant trauma involved. The entire nose must be reconstructed in order to make the desired improvements. 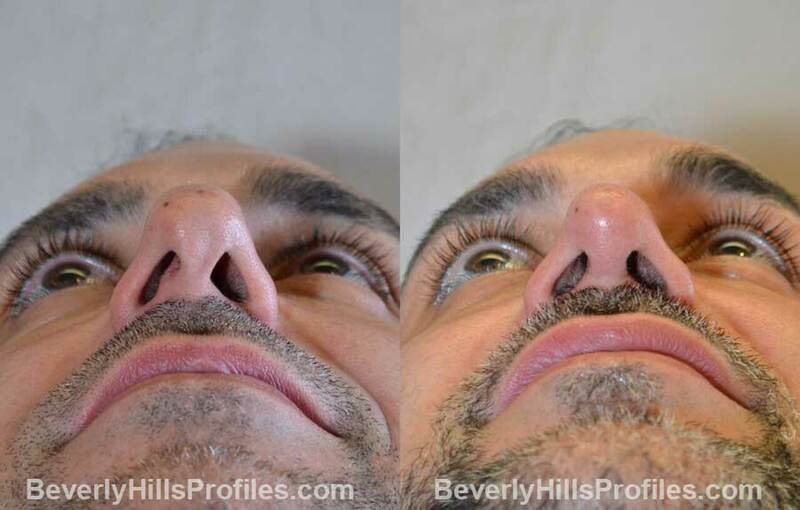 It took a lot of work to straighten and improve breathing in this patient’s nose. 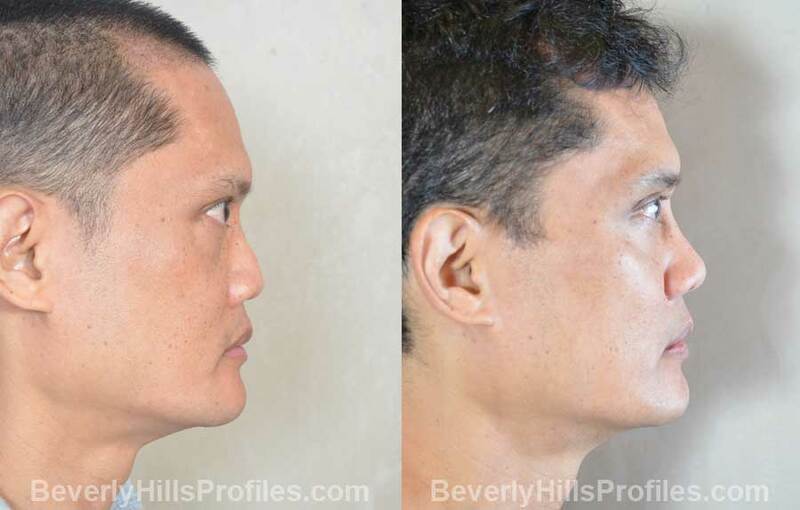 At the same time, his Beverly Hills Rhinoplasty was designed to make his nose a little smaller, more refined, and less down-turned while still looking natural. Even the scar on his tip was improved as part of his surgery. 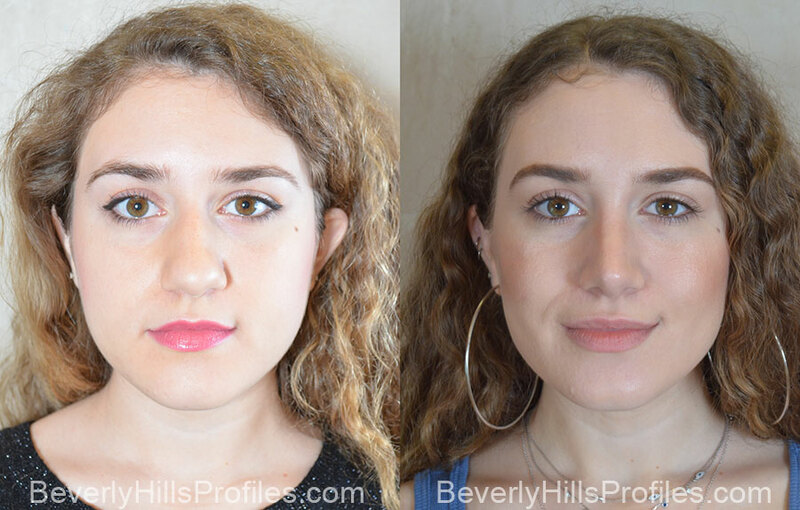 Case 43: Rhinoplasty in this pretty professional woman was all about removing the bump she had hated for years and correcting the tip droop and asymmetry that had worsened with age. Relatively small changes here have created a real sense of refinement while maintaining her long, elegant profile. 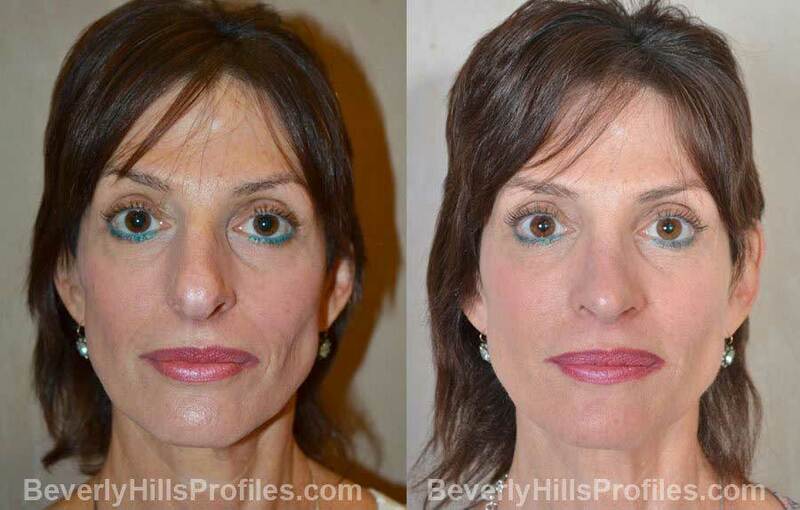 A lower face and neck lift along with facial fat transfer helped to round out the enhancements in her already beautiful appearance. 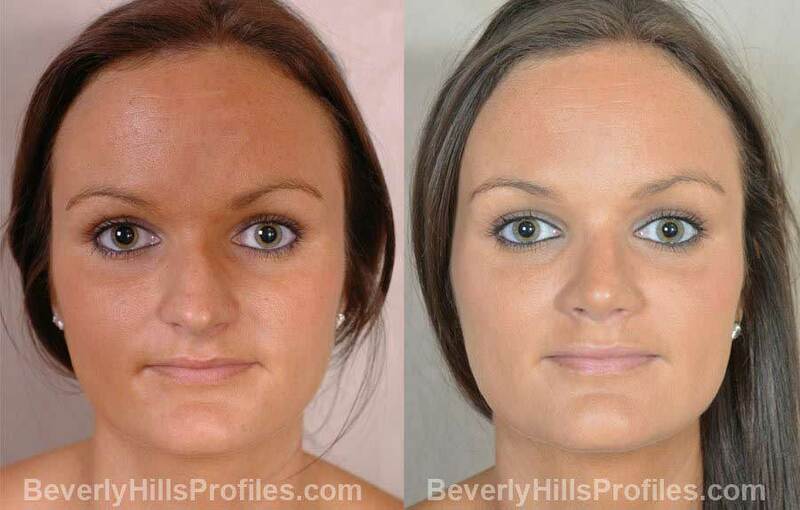 Case 44: One of the hardest things to accomplish in a nose job is giving a person a smaller version of the same nose. 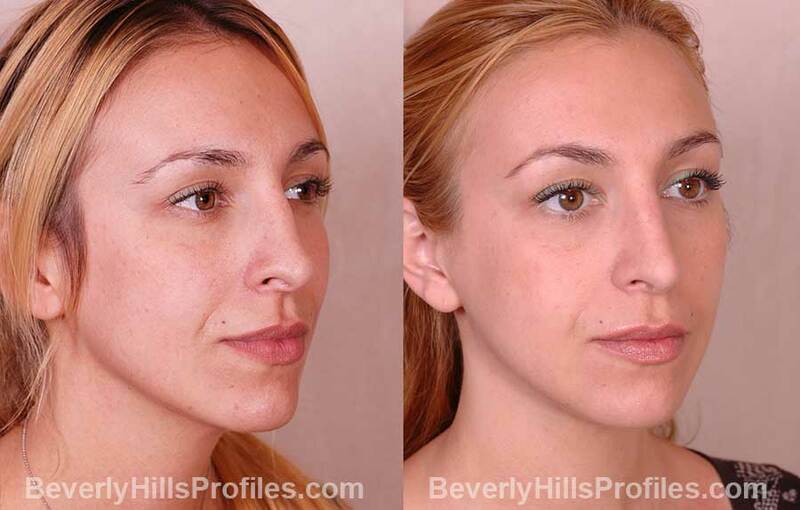 In Los Angeles, where small differences can mean everything, doing Finesse Rhinoplasty is common. 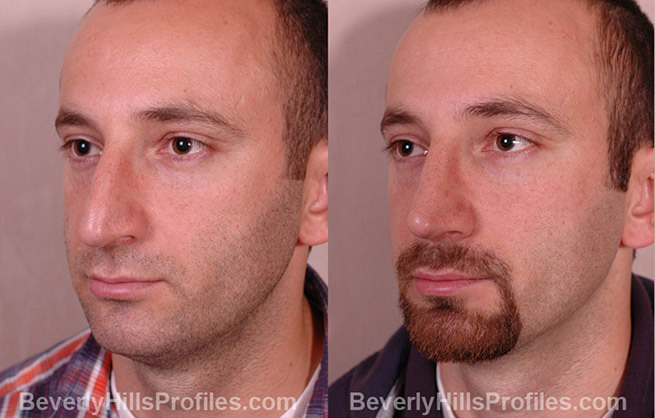 Even at 6 months, you can see that, on profile, this patient’s tip is less projected but he still has a strong masculine profile. On base view, you will also notice the deprojection and the fact that alar base reduction can be done with no visible scars and maintenance of the natural nostril curve. 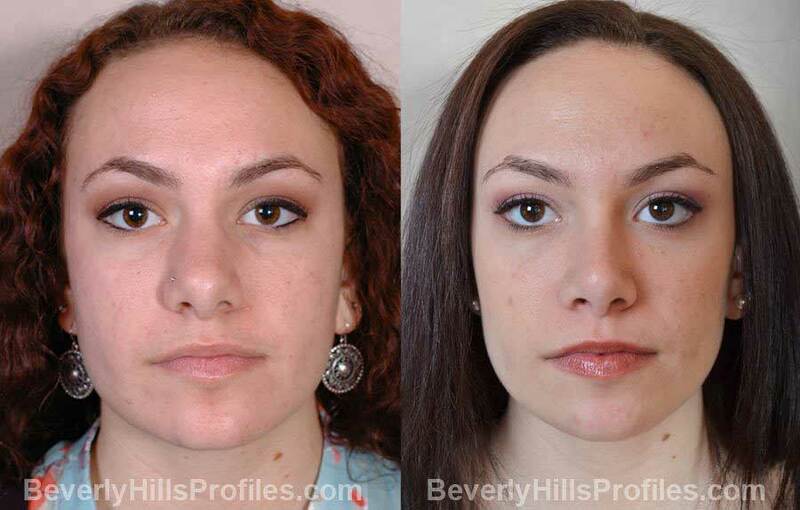 Case 45: Rhinoplasty in this young woman was about removing the nose as a focal point and, instead, calling attention to her beautiful eyes and smile. 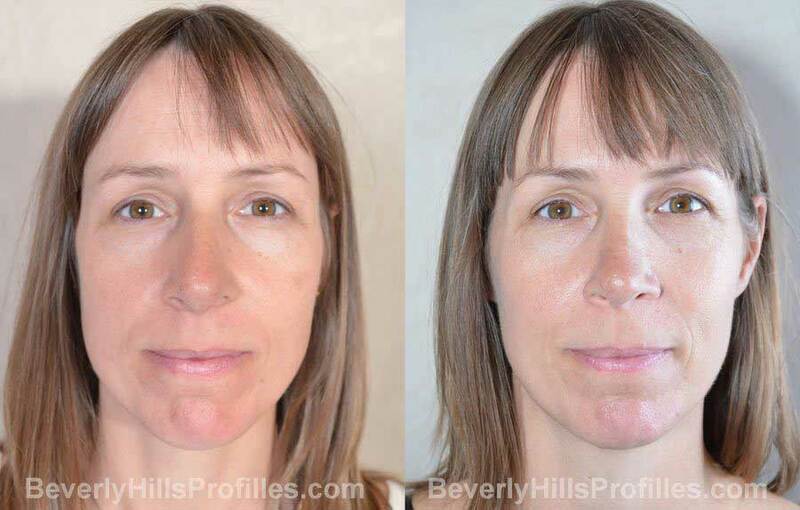 By reducing overall nasal width and setting back her falling tip, she looks both younger and softer in these 3-month photos while retaining an elegant profile that is not too small for her face. Case 46: A hump and hanging tip cause the nose to dominate otherwise beautiful features in this young woman. 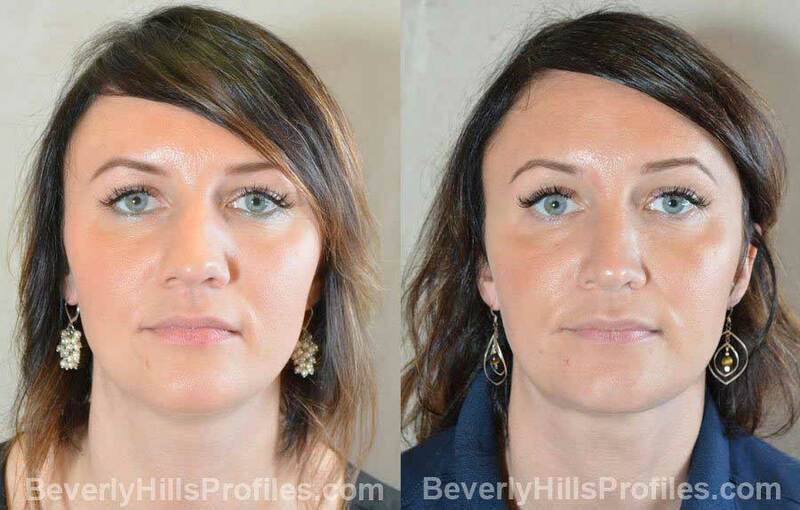 In this case, a tip lift, hump reduction, and tip refinement preserves some of her rounded appearance, very naturally enhancing her pretty eyes. On the bottom view, we see a good example of how open rhinoplasty incisions should heal virtually undetectably when done with care. Case 47: This patient’s primary surgery left her with valve collapse, nostril notching, persistent tip rounding and hanging columella. Secondary surgery involved correction of these issues with repositioning and reconstruction of the tip cartilages to improve tip contour. Although she is still a little swollen in the after photos, she is already happy with her new nose. Case 48: This is a good example of finesse rhinoplasty where subtle changes can make for a very nice and meaningful difference. This young woman liked the overall shape of her nose but wanted it slightly smaller in all dimensions to match her pretty, petite features. We were able to achieve these goals by always relying on techniques that produce stable and precise results. 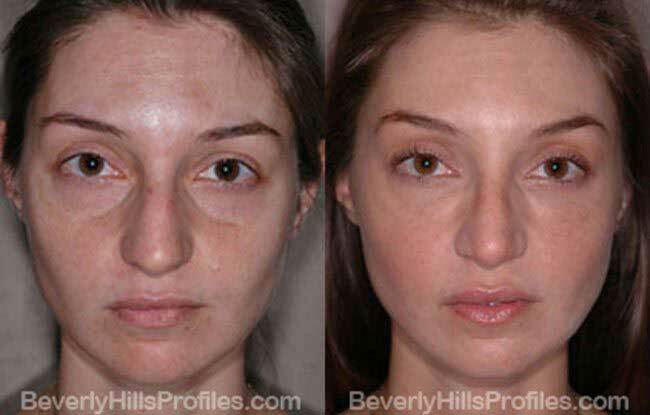 Subtle fat transfer to the under eye area further helped to reduce under eye circles and soften her overall look. Case 49: This young woman felt that her nose dominated her face. Overall narrowing of the nose including nostril reduction helped to enhance facial harmony. Reprojection and sharpening of the tip also helped to create a more defined nasal appearance. 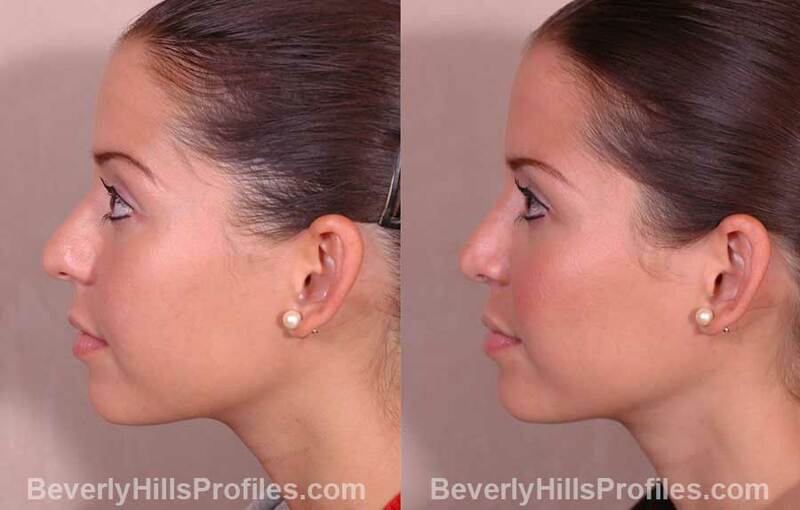 Case 50: A hump and a rounded tip can cause a nose to feel long and out of proportion with other features, especially in the setting of a softer chin. 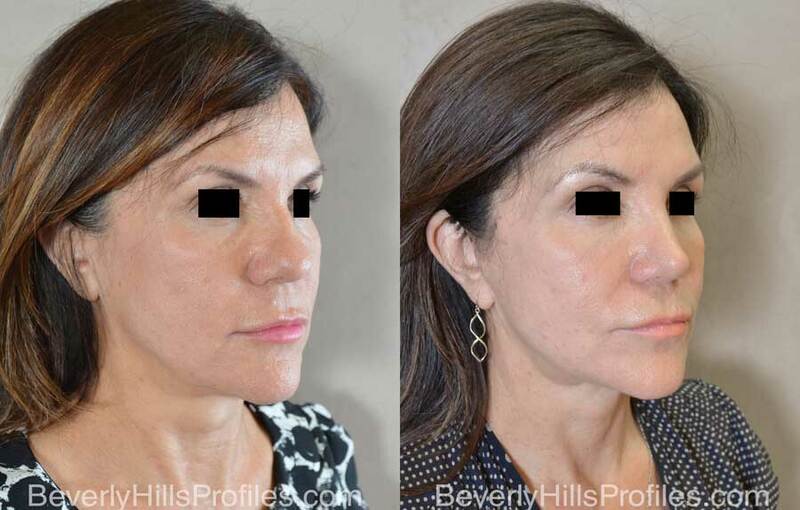 It is important in cases of thicker skin such as this to create a more structured nasal contour so that the desired refinement can be achieved as in this case. Case 51: This man was generally happy with his look but felt his crooked nose and tip droop were causing him to look older. Again, one can see here how subtle changes such as straightening the bridge along with restoration of a more symmetric and well-supported tip can not only harmonize appearance but even appear to turn back the clock. Case 52: Crookedness and breathing issues were the main concerns for this man. 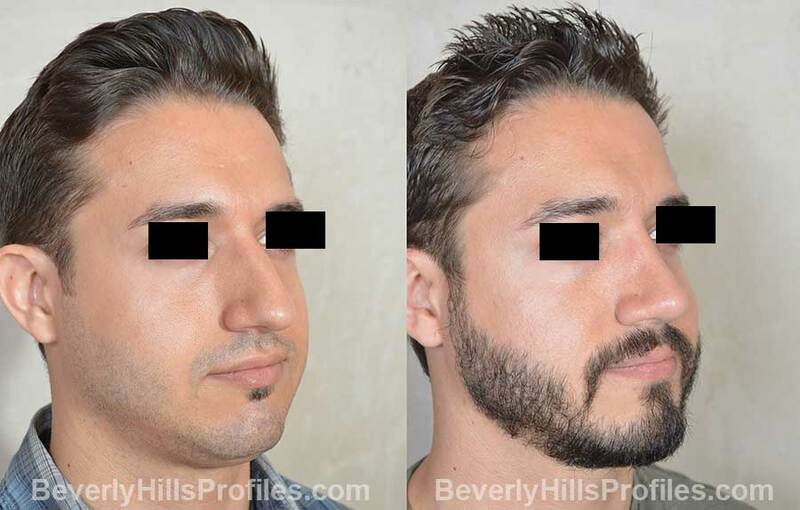 At the same time, tip deprojection and hump reduction succeeded in addressing his aesthetic goals by softening the slightly protrusive appearance of his nose. Case 53: This is a case of a typical broken nose with the associated curvature and nasal hump. 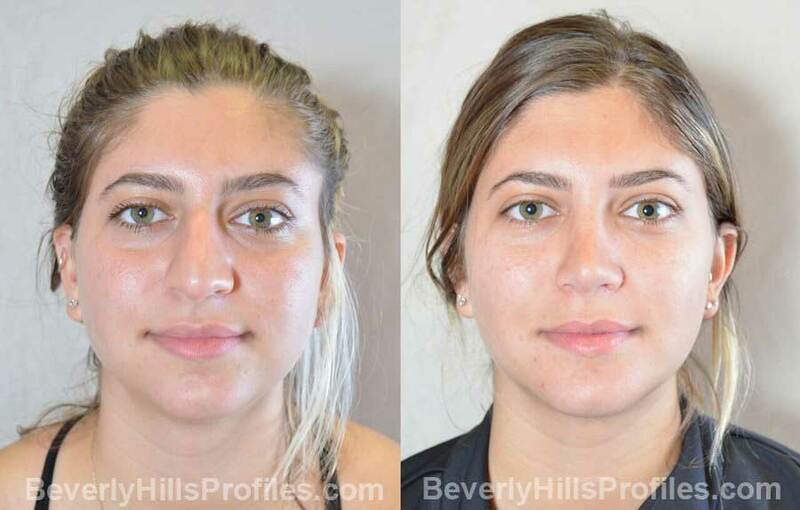 Corrective surgery focused on hump reduction, straightening, and some tip refinement to restore her nose to its pre-injury appearance. 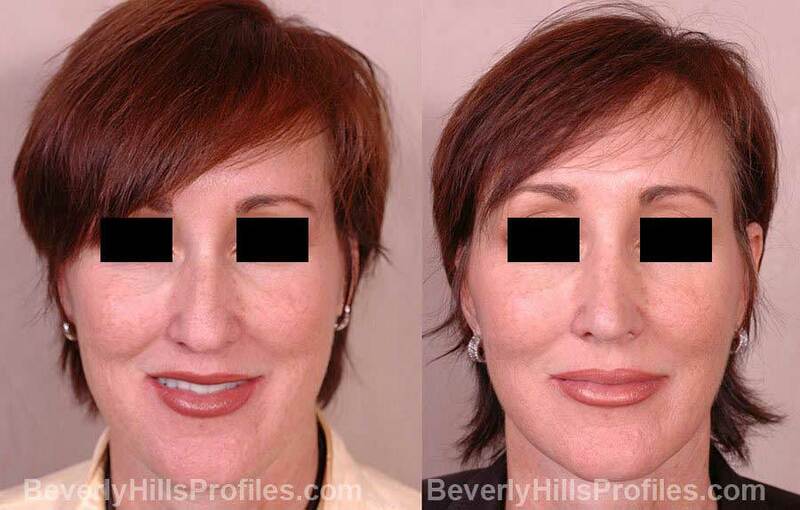 A chin implant also helped to balance her facial proportions. Case 54: This example shows how deprojection, straightening, correction of a hanging columella, and narrowing of the nose can de-emphasize its prominence and create a beautiful harmony with other pretty features for this patient. We love how the new look really brightens her eyes. Case 55: This young woman’s nose felt just a little too big for her face, especially on profile view where her nose was a little high all the way through. 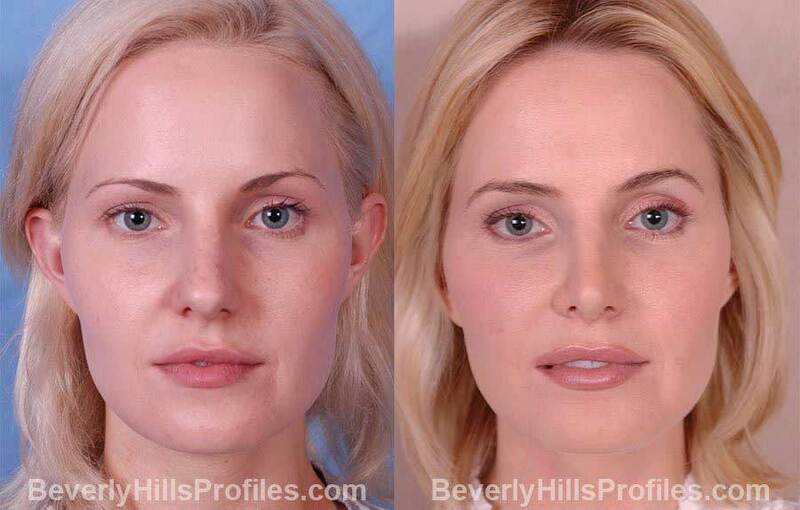 Deprojection and bridge reduction brought her profile into balance while at the same time increasing refinement on front view to highlight her beautiful eyes. Case 56: This handsome gentleman presented with a droopy tip and bump which along with his thick skin dominated his face. Postoperatively, he has a strong profile along with much improved tip definition and refinement. 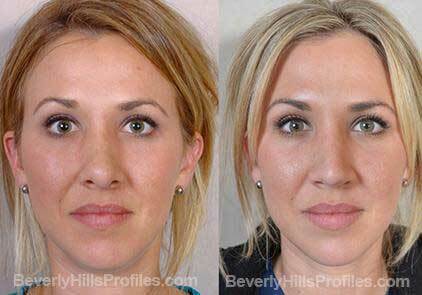 Case 57: This beautiful lady is a great example of rhinoplasty achieving a more youthful overall look. You’ll notice on front view her tip is more refined and her nostrils have been reduced, and on profile her nose is subtly rotated resulting in a very youthful change. 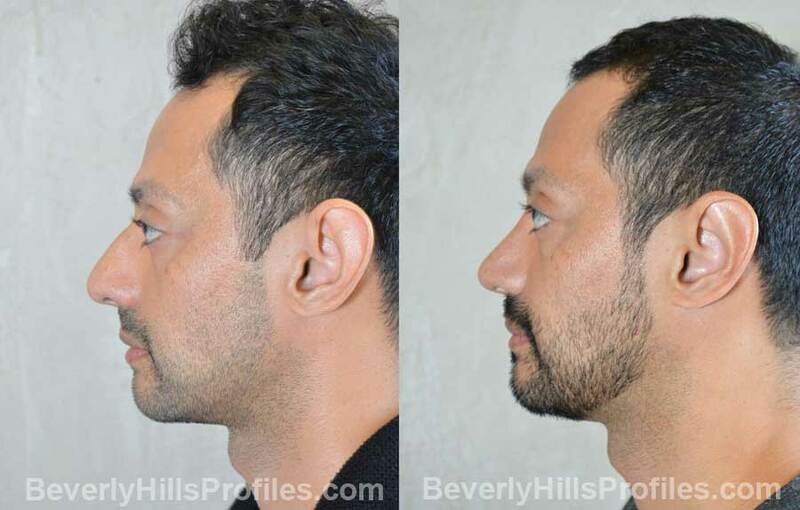 Case 58: This is a good example of a finesse rhinoplasty which involved a small hump reduction and slight lifting, straightening, and correction of tip asymmetries. You can see that even subtle changes can take away the feeling of length and a droopy tip to enhance her overall appearance. Case 59: This 22 year old young woman disliked the width and thickness of her nose. She was otherwise happy with her profile but wanted to reduce the sense of rounding and improve the hanging columella. At one year, she has a beautifully natural nose that compliments and softens her look. 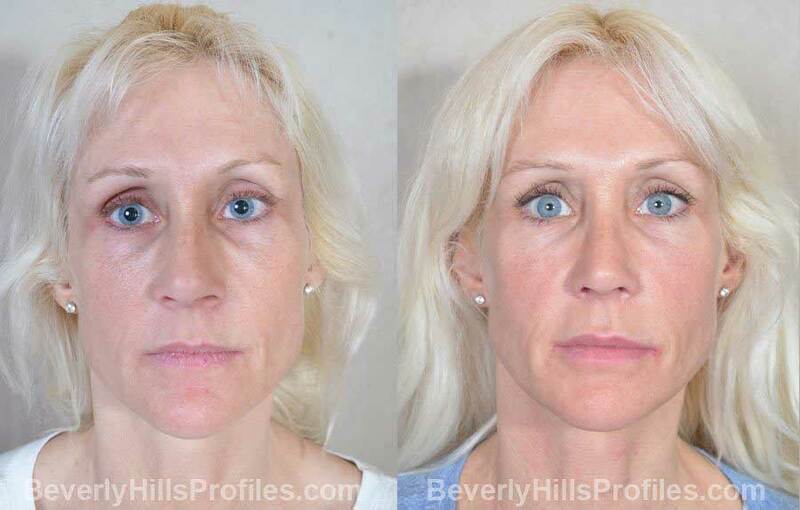 Case 60: Facial aging can be hard on someone who is naturally thin by creating a more severe and skeletonized appearance as facial fat is lost. 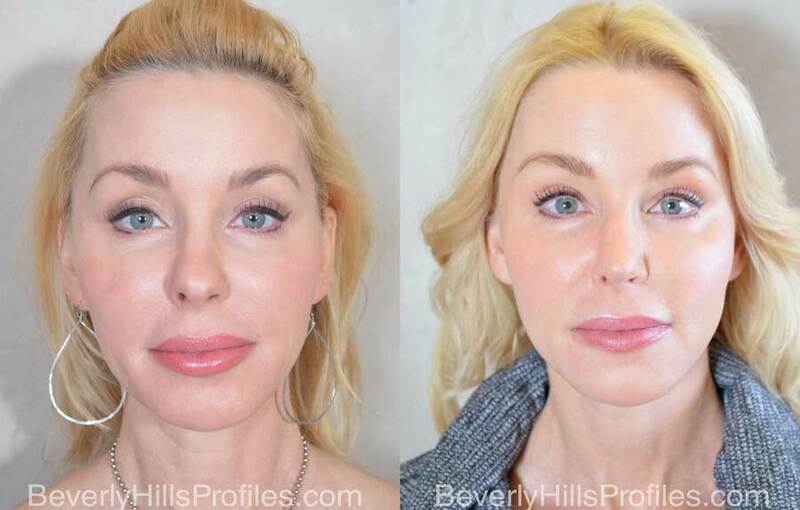 A combined approach was used to create a beautiful transformation, including a trichophytic brow lift, lower lid tightening, and facelift along with a conservative rhinoplasty to straighten and balance her nose. Notice how the eyes are opened up and facial hollows are smoothened without the surprised look that can accompany over-aggressive lifts. You’ll also see that incisions are hidden within the hairline and natural skin creases making them almost invisible. Case 61: The concerns in this case were crookedness and a significant breathing issue due to a severely deviated septum. She also felt her nose was over-projected and a little too big for her face. Here we can see resolution of her crooked septum on base view. The tip has been defined and de-projected and the bump brought down to create a naturally pretty and more balanced contour. 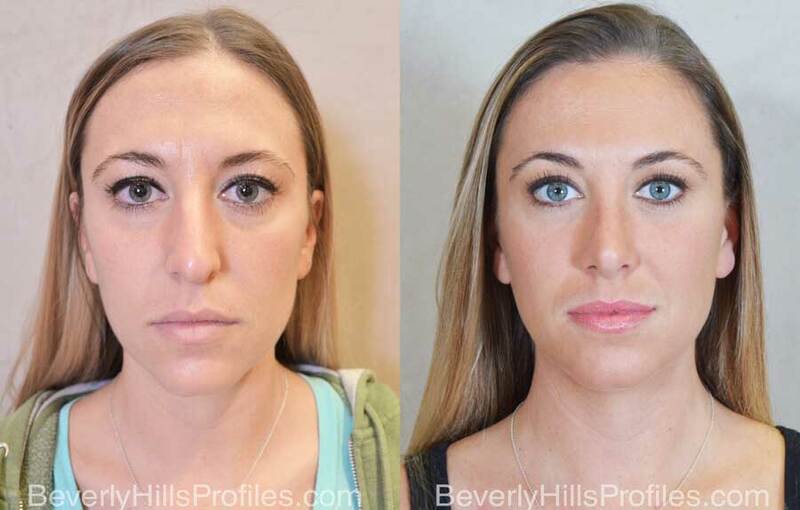 Case 62: A boxy and droopy tip can create a sense of facial imbalance for a woman like this who has naturally thinner, more slight facial features. Support and narrowing of the tip along with hump reduction helped to create a smooth contour that is in much better proportion with her other facial features. Case 63: This young woman was unhappy with her bump and was also having breathing concerns from a deviated septum. 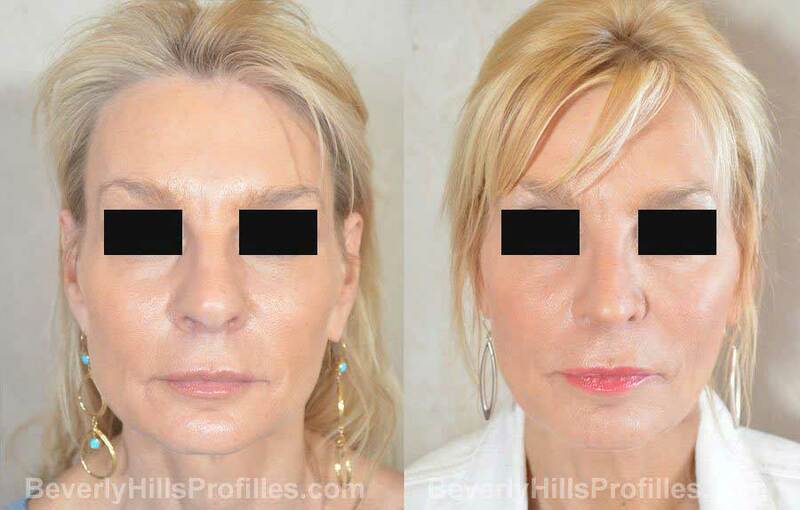 Septorhinoplasty was able to correct her breathing issues and create the softer, more feminine profile that she preferred. 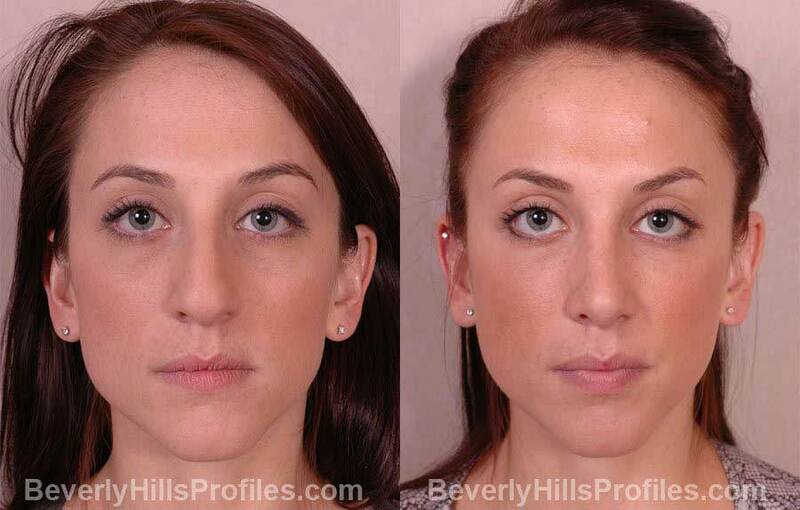 Case 64: This woman had thought about having rhinoplasty for a long time. She was unhappy with her crooked nose and bulky tip that drew attention away from her other features. 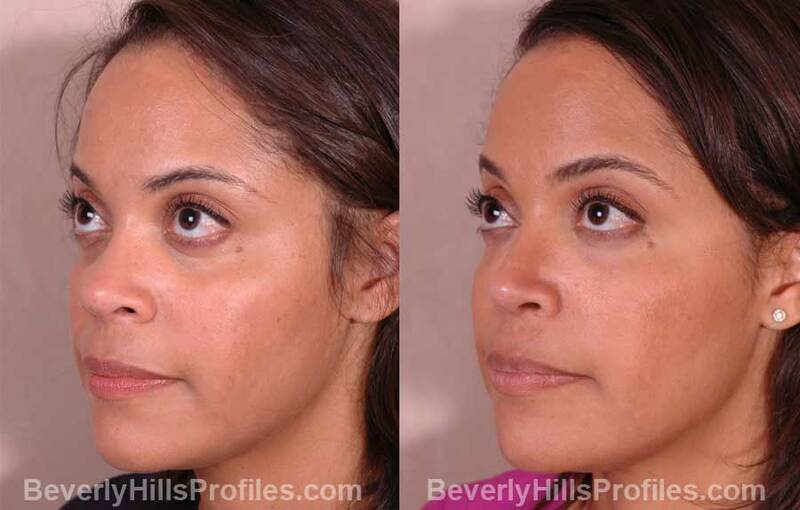 Septorhinoplasty achieved narrowing and definition while also straightening her crooked bridge and tip as seen well on the base view. 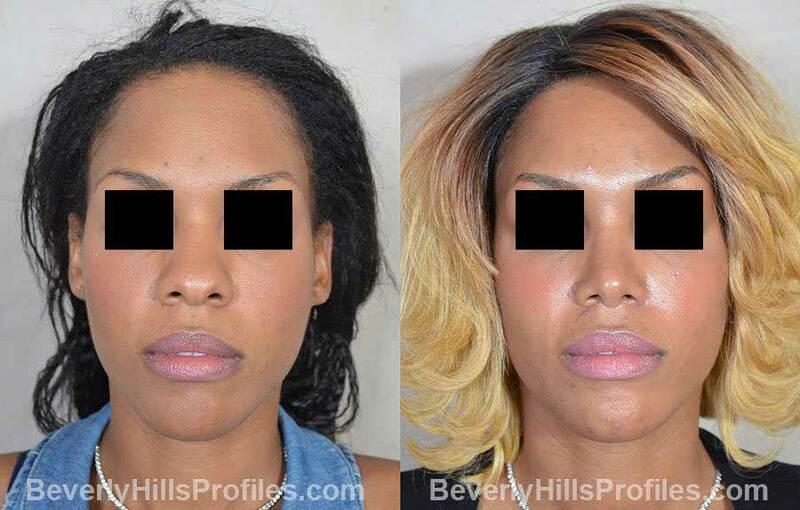 Case 65: Septorhinoplasty here was focused on straightening and correcting a deviated septum, increasing length and tip definition along with removal of a dorsal convexity. 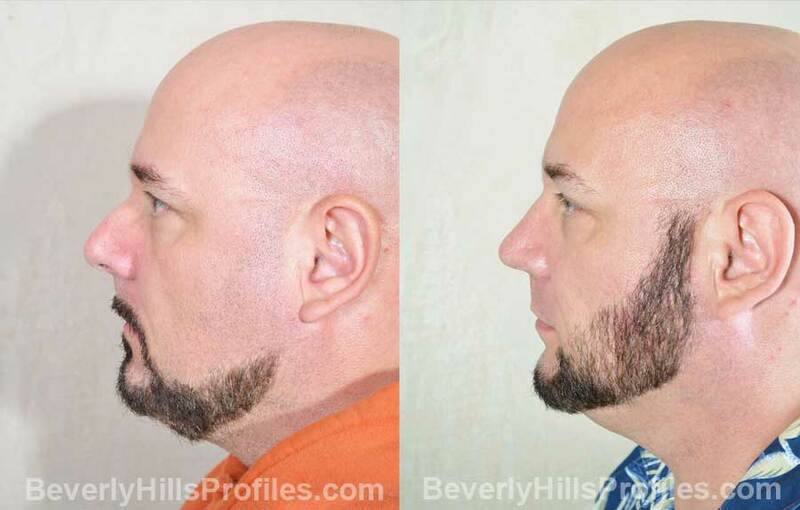 At the same time, neck liposuction helped to further restore a more streamlined and youthful appearance. Case 66: This patient has slight facial features and always felt that her nose felt too big for her face. Rhinoplasty focused on deprojection, reducing length, hump reduction, tucking the columella, and narrowing the tip to create a more harmonious nasal contour. She’s very happy that her nose now matches her face perfectly. Case 67: The main concerns for this patient were the dorsal bump, asymmetry, and downturned appearance to the tip. In this case, fixing tip asymmetry, softening the bump, and changing the tip contour helped to remove the nose as a point of distraction. Case 68: This was essentially a functional rhinoplasty to straighten his crooked nose and fix breathing issues as can be seen on the base view. At the same time, he wanted to soften his look by removing the convexity of his bridge line and somewhat defining the tip. Case 69: This patient was bothered by his prominent ears and a sense of width to his nose that made it feel bulky and unrefined in his view. 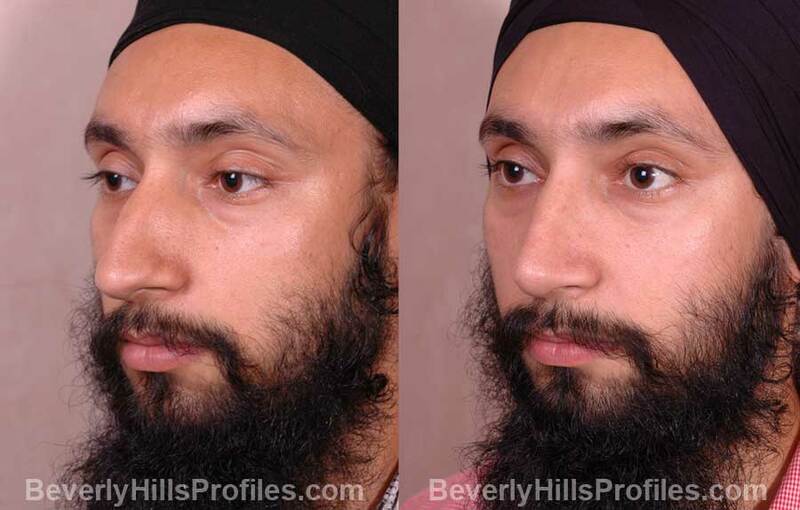 While still preserving his ethnic identity, he was able to achieve a meaningful improvement in nasal balance. Bringing his ears back into the vertical plane helped to make them less noticeable and remove them as a source of focus for him. 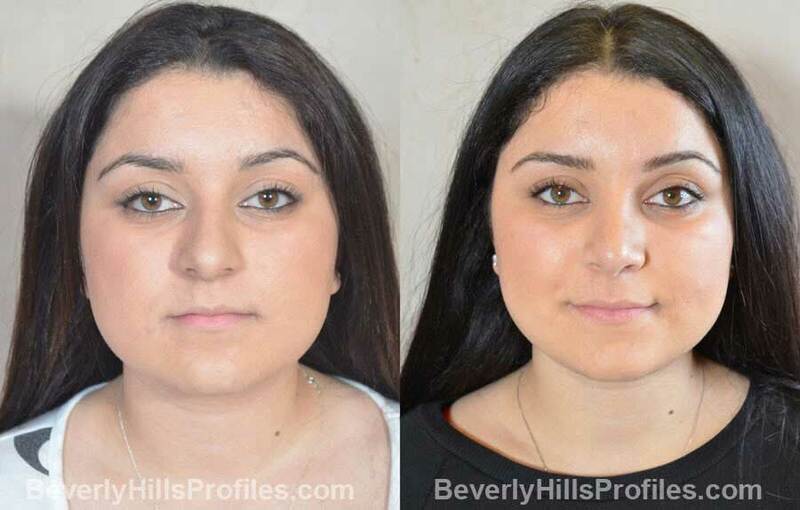 Case 70: With a small chin, this young woman felt that her nose was taking over her face, bringing undue attention to her mid-face and making her look more cheek-y. 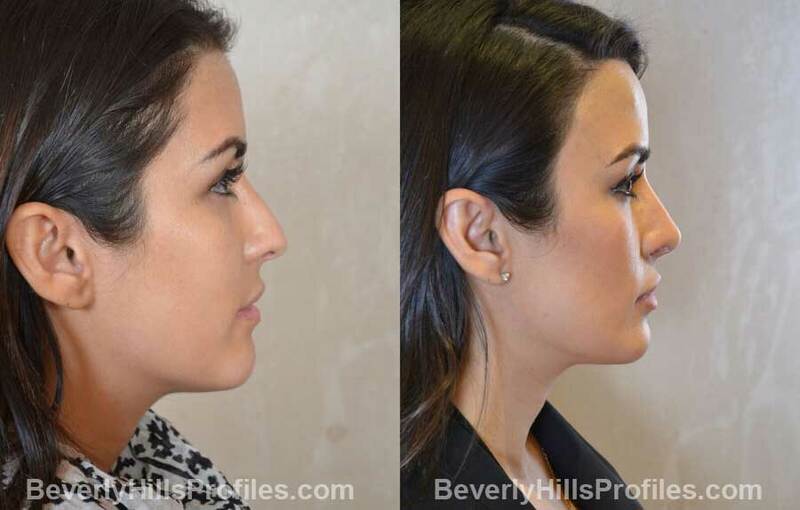 A combination of rhinoplasty and a chin implant with neck liposuction helped to restore a beautiful balance to her features. She couldn’t be happier with the result. 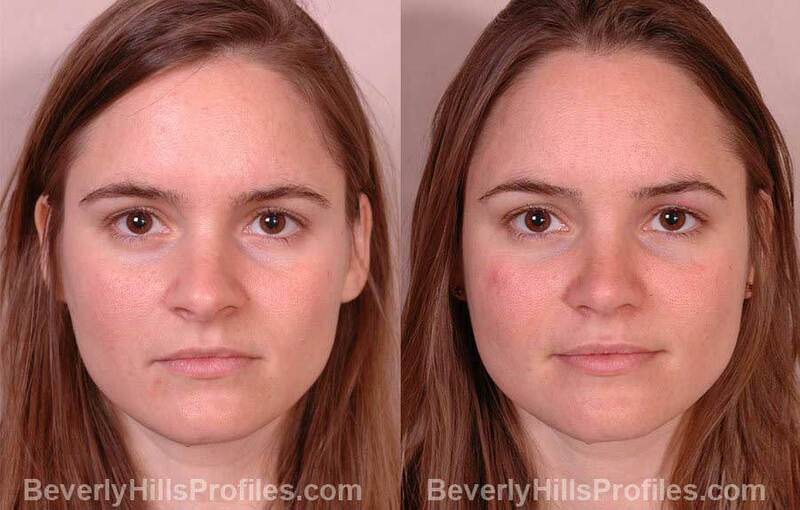 Case 71: Tip and nostril width and overall nasal projection made the nose feel dominant for this young woman. 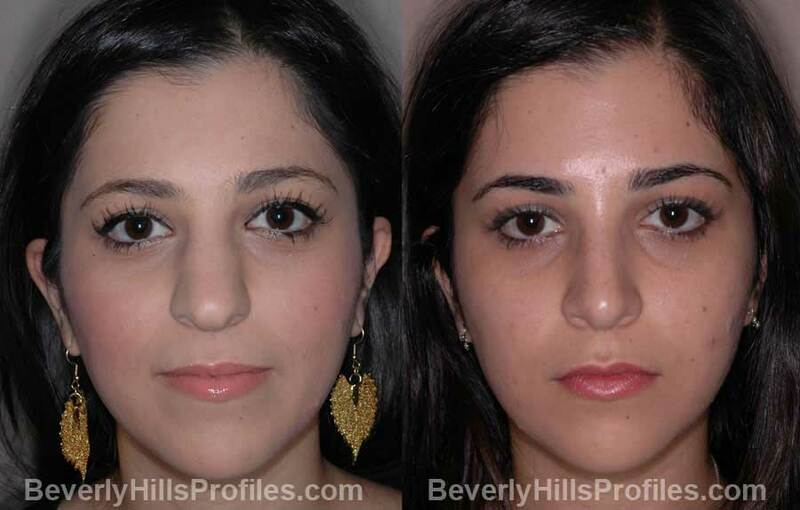 Rhinoplasty involved making her whole nose smaller by deprojecting, refining the tip, and removing some nostril flare. At the same time, a nasal fracture and breathing concerns were addressed. 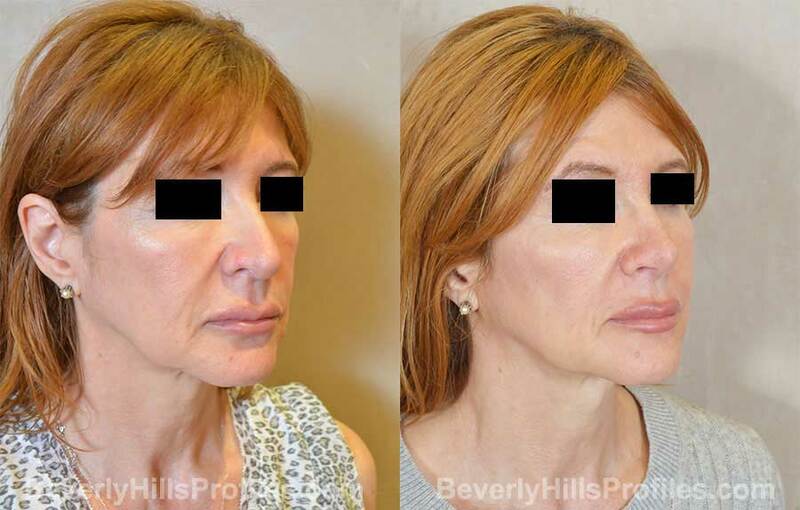 Neck Liposuction also helped to define and re-balance her jawline to create the improved facial proportions that she desired. Case 72: This patient had sustained a nasal fracture that caused a significant deviation of her nose. The fracture was corrected along with a septoplasty to improve breathing. Loss of tip support after the injury made her hump look more prominent and her tip felt more droopy. 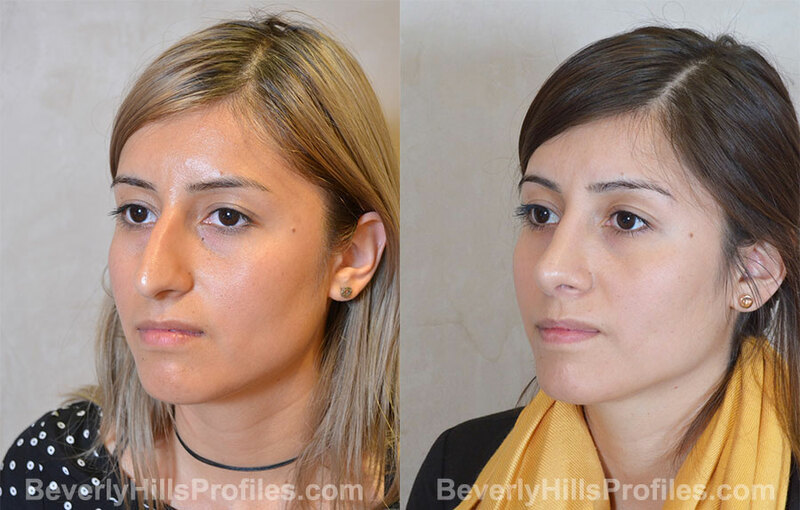 The bump was smoothened and her tip angulation restored to create the softer, more feminine profile she wanted. 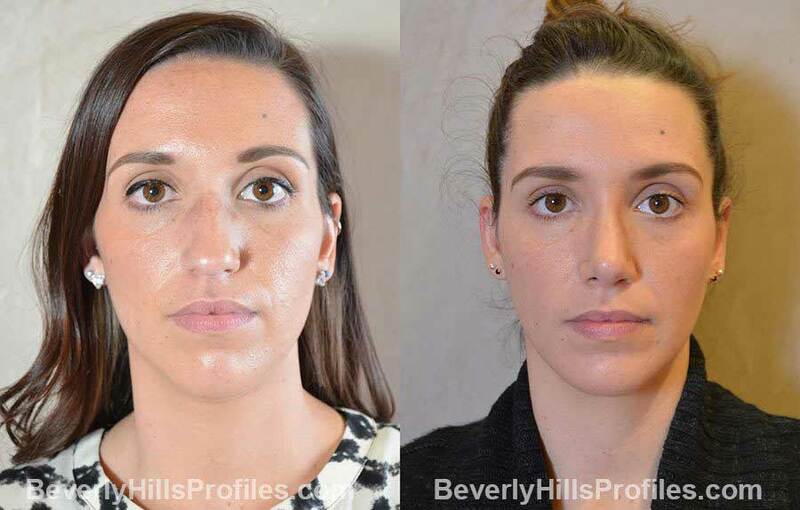 At the same time, fat transfer to the cheek and under eye area and subtle neck liposuction substantially improved the flat cheek and mid-face contour that previously made her feel hollowed and tired looking without makeup. Case 73: Removal of the bump with improvement in nasal tip refinement and drooping were the main goals for this patient. Importantly, she wanted to preserve her overall look with an emphasis on softness and a more feminine contour. Case 74: This patient wanted to achieve a much smaller nose with significant refinement and correction of her bulbous and droopy tip. She’s very happy that her new nose is now much more harmonious with her features. 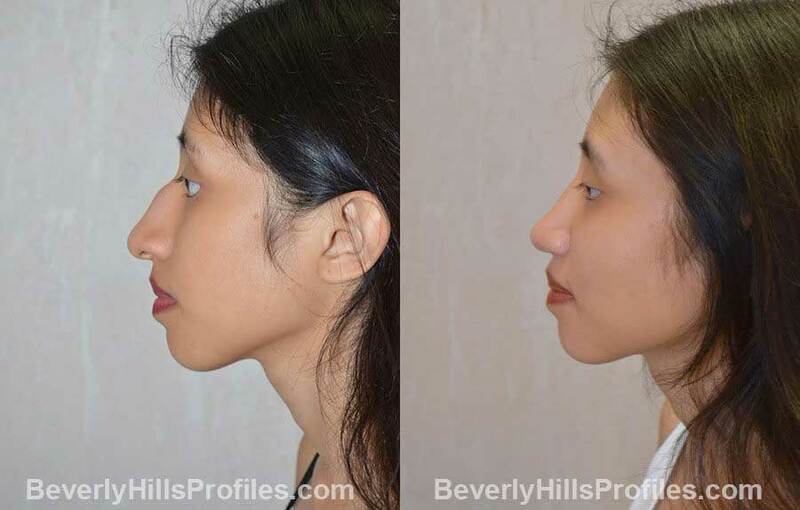 Case 75: Getting a severely crooked nose as close to perfectly straight as possible is one of the hardest things to accomplish in rhinoplasty. 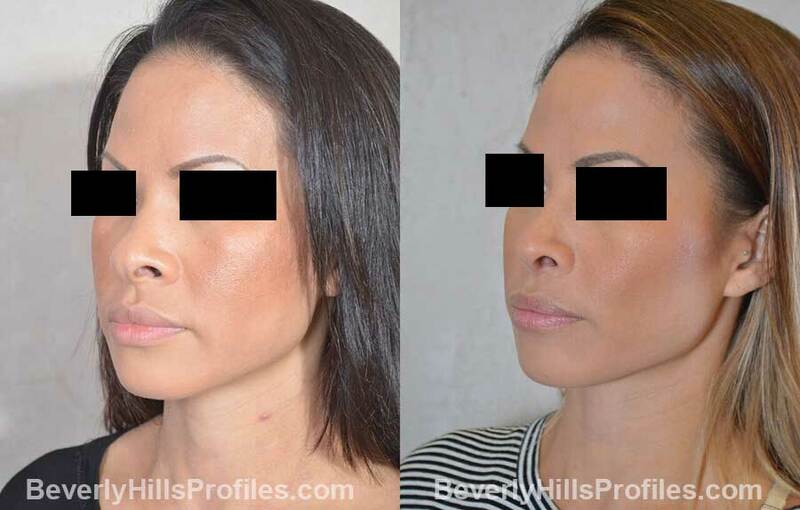 Our extensive experience at Profiles with traumatic noses has us well positioned to treat these difficult cases and achieve a nasal contour that is no longer a focal point but now blends with the rest of her features. Case 76: This patient wanted to achieve maximal tip refinement and hump reduction. She preferred a slightly sloped bridge line with a slight supra-tip break. We are careful in such cases to create a softer profile without looking excessively scooped or washed out. Case 77: This patient was very bothered by her nasal hump and crooked nose which were softened dramatically. But, perhaps an even more spectacular improvement was achieved with liposuction alone that has completely transformed her jawline contour. Case 78: A combination approach was used here to create a really meaningful but completely natural transformation. Otoplasty made prominent ears all but disappear from the field of view and no longer distract or draw attention. 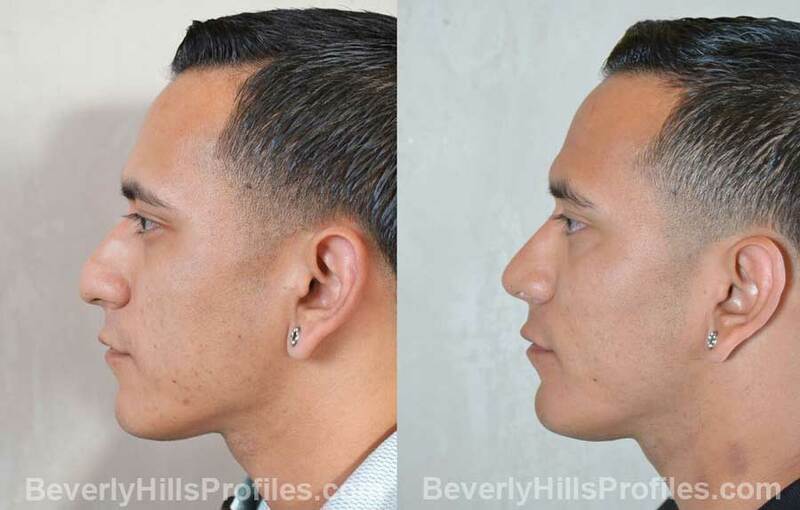 At the same time, rhinoplasty, chin augmentation, and neck liposuction accomplished were able to remove a nasal hump and overprojection while improving chin and neck laxity to achieve a nice overall balance. Case 79: Rhinoplasty in this patient was undertaken to narrow her nose, including correction of a rounded bifid tip and nostril flare. This was able to achieve improved facial harmony while preserving her ethnic identity. 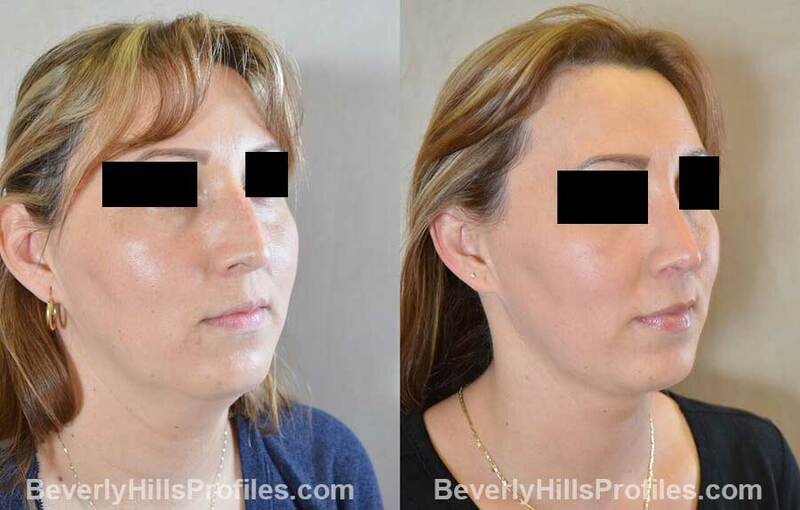 Case 80: This patient wanted to maintain her projection but soften the nasal contour by achieving straightening, some tip refinement, and reducing some of her dorsal height and curvature. Case 81: A badly crooked nose and septum were the main motivations for undergoing septorhinoplasty for this patient. At the same time, she had always been uncomfortable with her nasal shape and was hoping for improvements in that area as well. 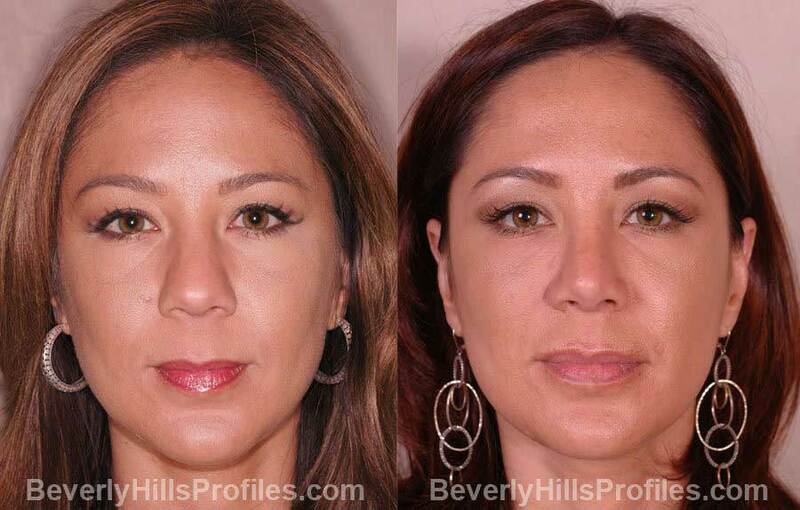 Open septorhinoplasty was able to accomplish all of her aesthetic and functional goals. Case 82: This patient really disliked the width and bulkiness of his nose and wanted a much more streamlined contour. He is really happy with the level of definition and refinement that he was able to achieve. Case 83: This patient wanted to achieve significant definition and refinement of her bulbous tip. At the same time, a slight dorsal convexity was reduced and her mid-vault narrowing was supported with improvement of her nasal breathing. 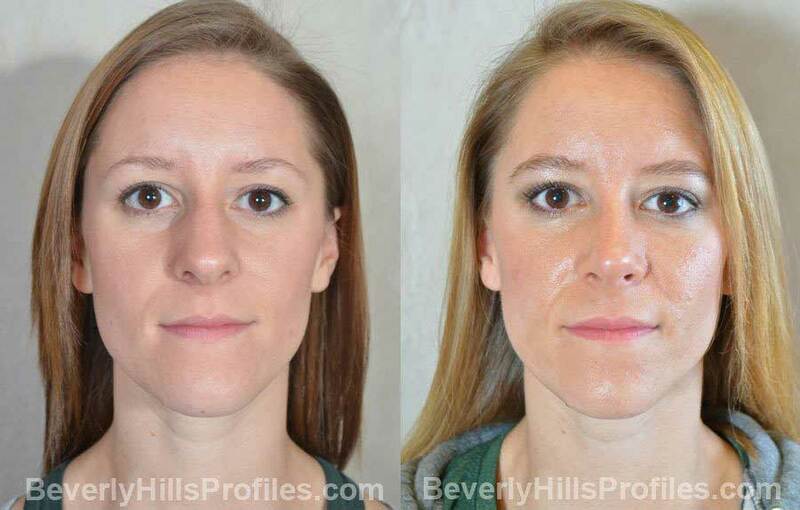 Case 84: A severely broken nose not only impacted her breathing but made this patient self-conscious about her nasal appearance. 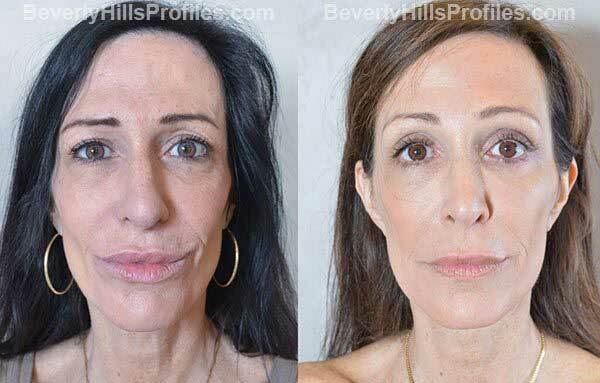 The focus here was on straightening, removing the traumatic bump, and re-supporting a droopy tip. Now, her nose goes unnoticed and she couldn’t be happier. Case 85: This young woman really disliked her nasal hump and droopy tip. 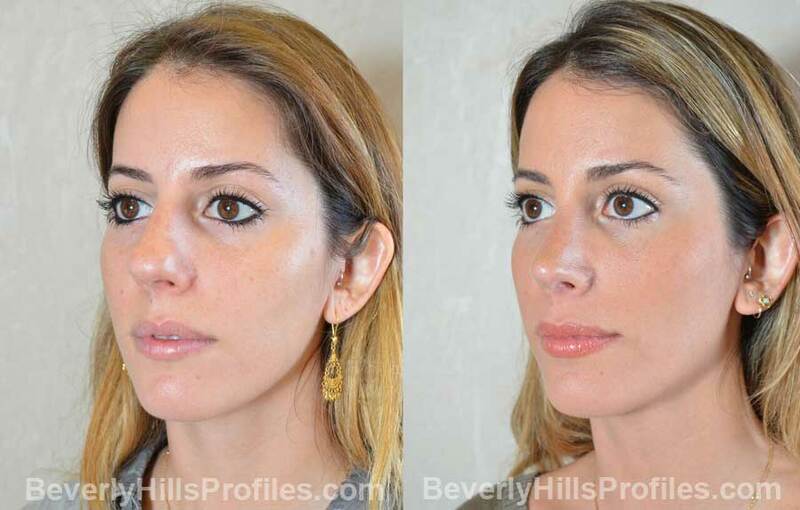 She preferred a much softer aesthetic with a slight dorsal break that we were able to accomplish with rhinoplasty. That combined with a medium chin implant really helped to soften her look. Case 86: Aside from crookedness and difficulty breathing, this patient felt her nose was too large and too projected for her face, making her look more harsh than she wanted. 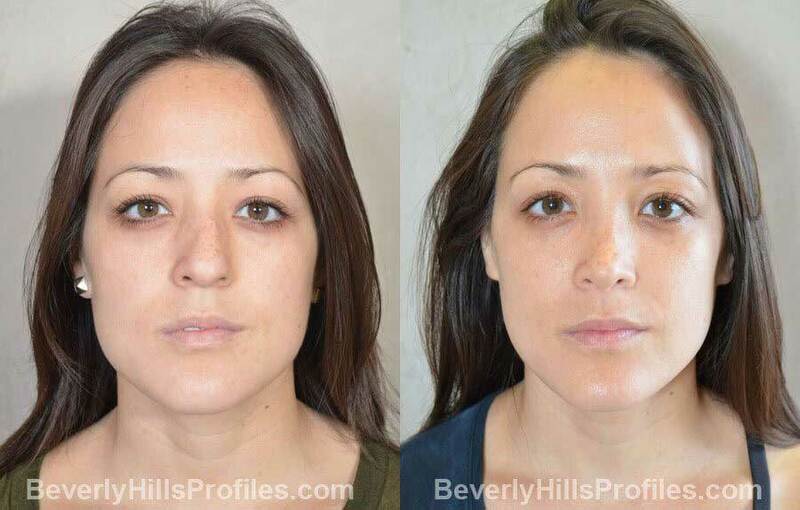 Septorhinoplasty involved straightening, hump removal and deprojection to significantly soften her look. She’s thrilled with the result. Case 87: This young woman had broken her nose and was noticeably crooked with poor nasal breathing. In addition, she disliked her nasal hump and length. She preferred an aesthetic with a slight supra tip break to soften her profile. 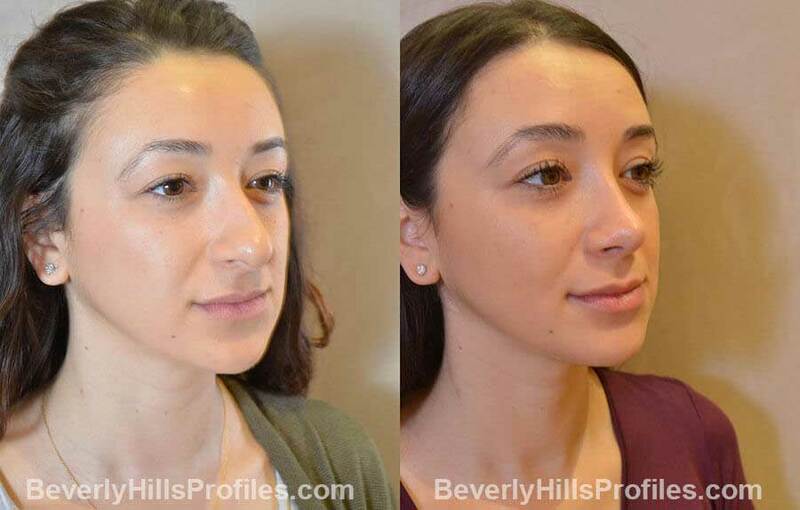 Beyond straightening and improving her breathing, you can see how we were able to remove the nasal hump and lift her tip to transform her look while still looking completely natural. Case 88: The goals of this septorhinoplasty were to straighten her crooked nose and improve breathing. She also hated how her nasal hump and length brought attention to her irregular profile. 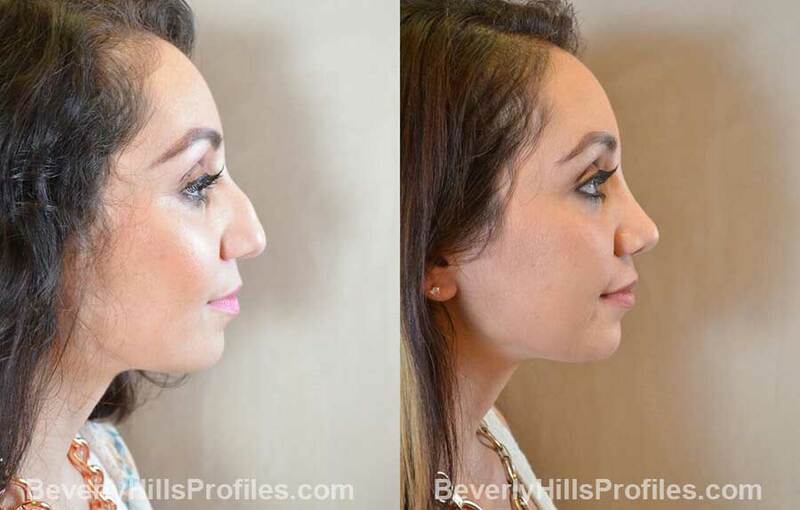 In our opinion, the mark of a good rhinoplasty is that the nose should become a background feature, and she’s very happy to have achieved that goal with her Profiles rhinoplasty. Case 89: This patient had broken her nose with consequent severe loss of tip support, tip rounding, crookedness, and a traumatic bump. In this case, a lateral crural overlay technique was used to reduce and lift the tip along with a septal extension to help with support and straightening which has improved tremendously as seen on the base view. Even though she’s still swollen in these early photos, she already has a great result and it’s only going to get better. 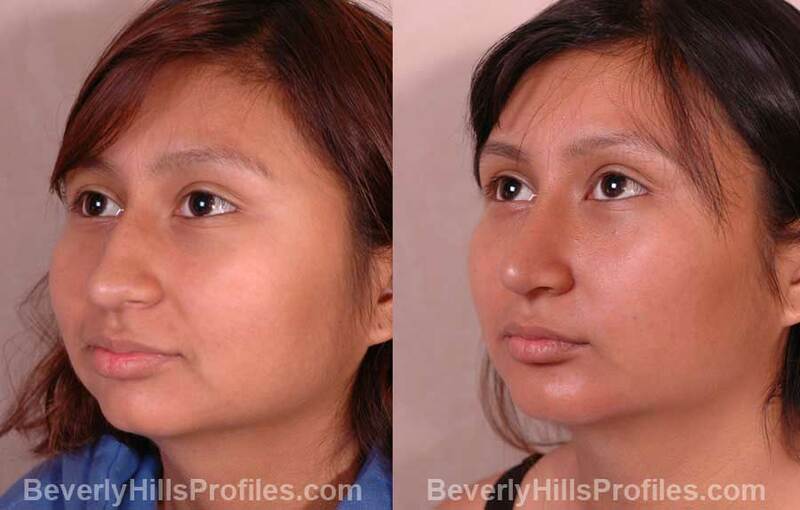 Case 90: This young woman has slight features and felt her nose was too dominant for her face. Our surgery comprised straightening and correction of breathing as well as reduction of the dorsal hump and minor tip setback. Her nose now blends seamlessly with her features and really highlights her eyes. Case 91: In addition to a crooked nose and breathing problems, this patient felt her nose was overprotected and disliked her hanging columella. 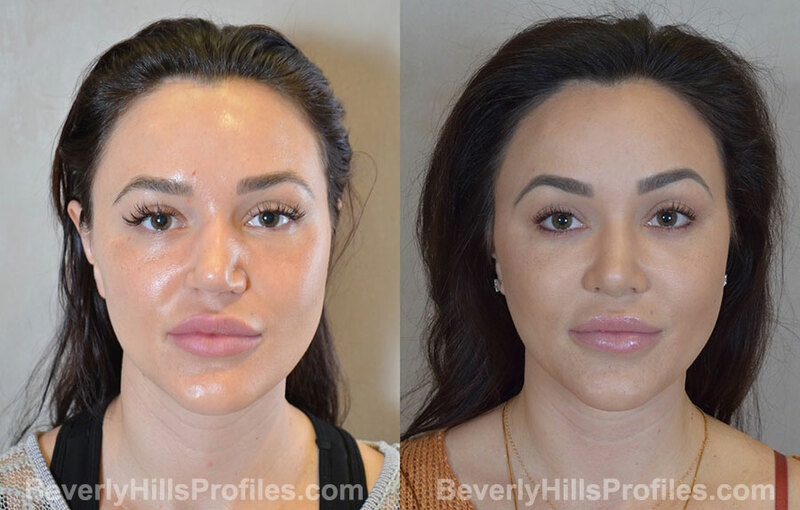 She liked the look of a softer nasal contour with a slight supra tip break, and she’s very happy with how her rhinoplasty turned out as it now just makes sense for her face. Case 92: This procedure was all about correction of a droopy twisted tip. This patient was especially bothered by the tip’s tendency to drop and spread when she smiled, with a twist that made one nostril look higher than the other. 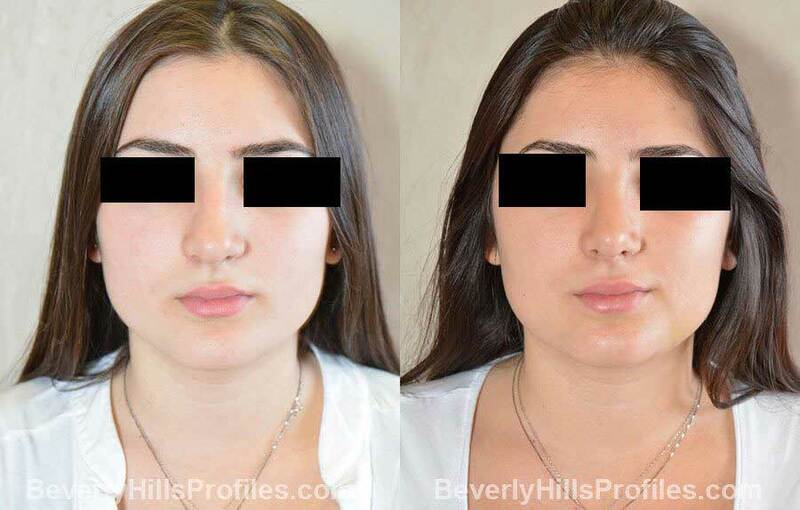 After surgery, her nose is about as straight and symmetric as can be and the straighter bridge line makes her look younger. 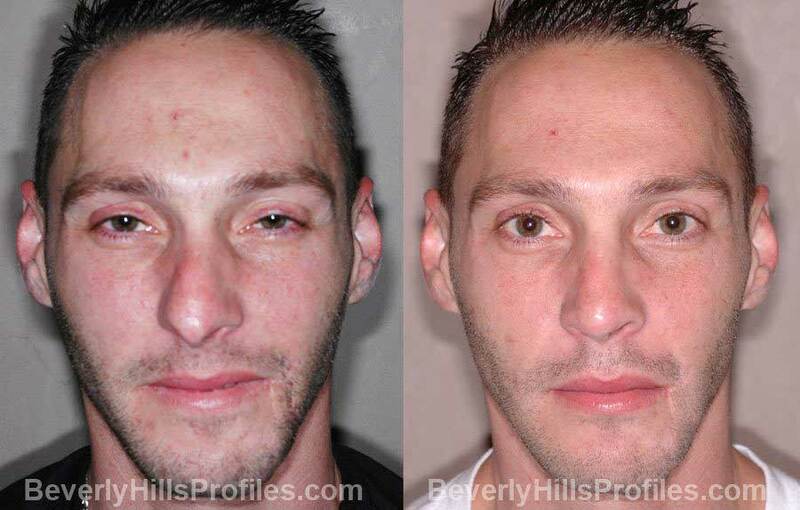 Case 93: Sometimes rhinoplasty can make a transformational change. 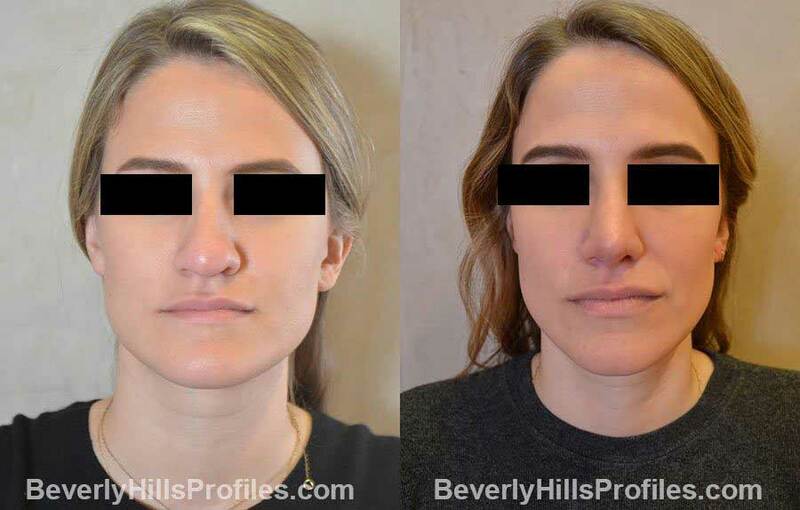 In this case, reducing a hump along with straightening, defining, and lifting the tip have given this patient a completely different look and removed her nose as a point of distraction. Look how much brighter her eyes look! She is thrilled with the result. 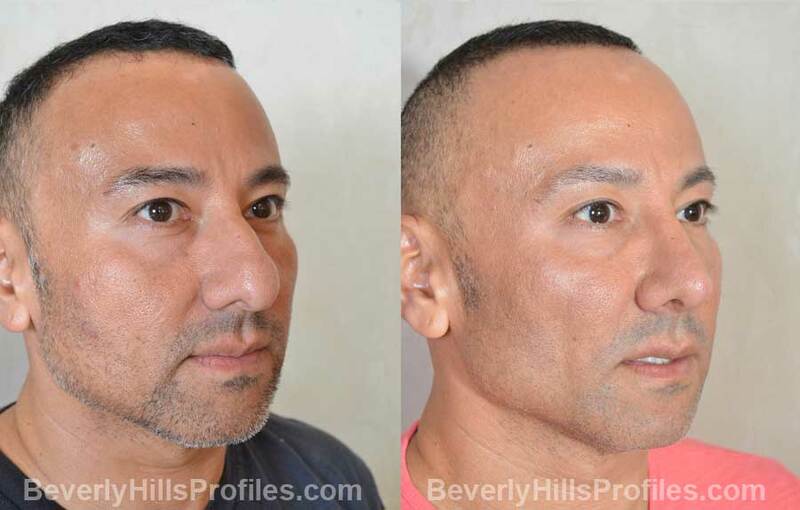 Case 94: This patient was seeing the early signs of facial aging including loss of skin tone and elasticity, early jowling, and heaviness under the chin. 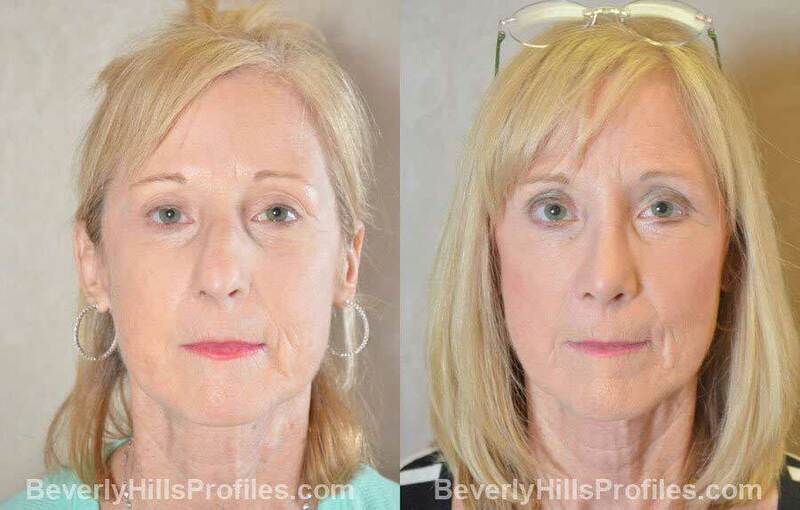 A lower facelift along with fat transfer to the under eye and cheek area substantially improved the contour and even apparent texture of her skin, making her look noticeably younger. 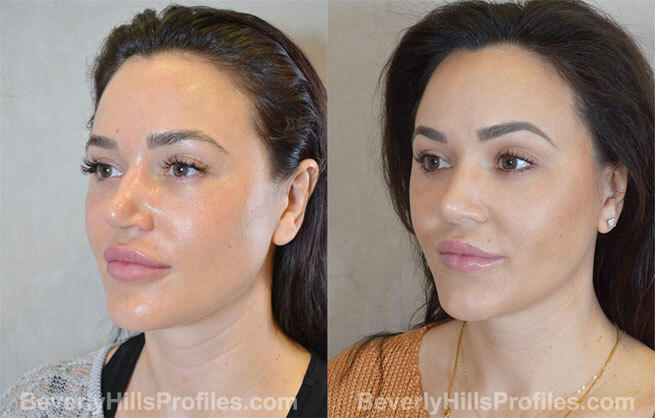 In addition, the overall effect was completed with a rhinoplasty focused on reducing the width, rounding, and thickness of her tip and nostrils which is a challenge in the setting of thick skin. 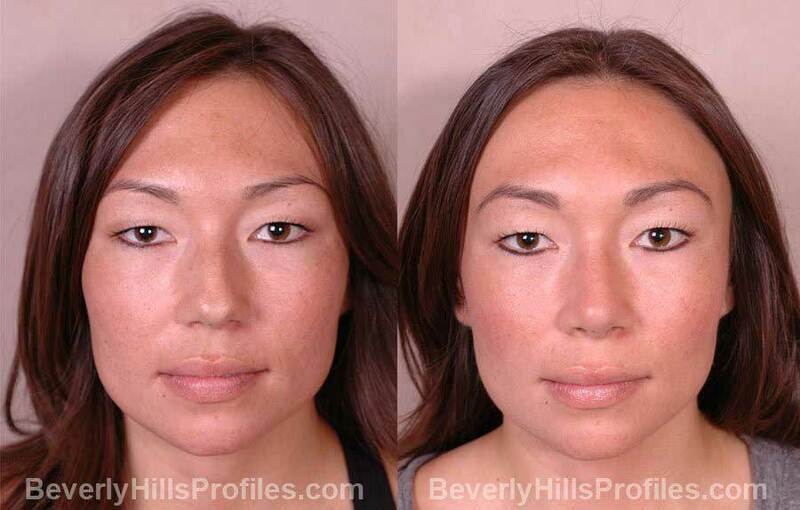 Case 95: Fat transfer was used here to improve under eye depth and symmetry, and to give more structure to the cheek mound to create a better highlight over the cheek bones. In addition, finesse rhinoplasty involving primarily the tip helped to reduce tip boxiness and asymmetry to give a more streamlined appearance. 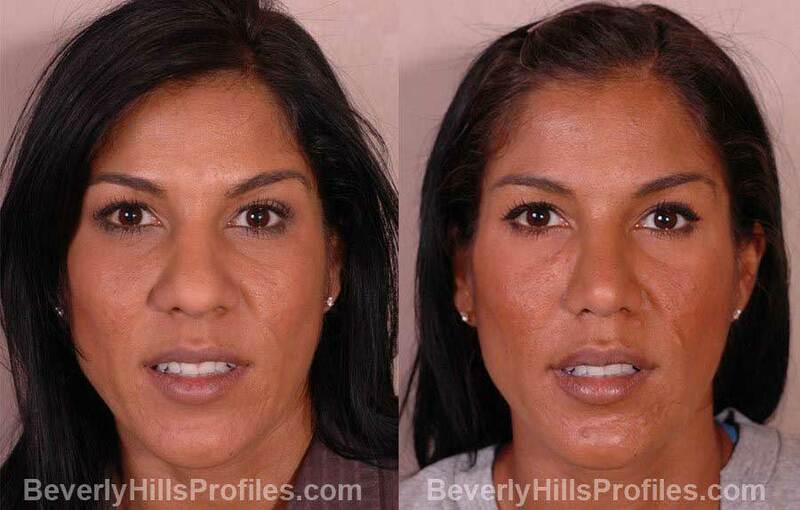 Case 96: To see how well our results last, see these photos of our patient 8 years after rhinoplasty and facial fat transfer! 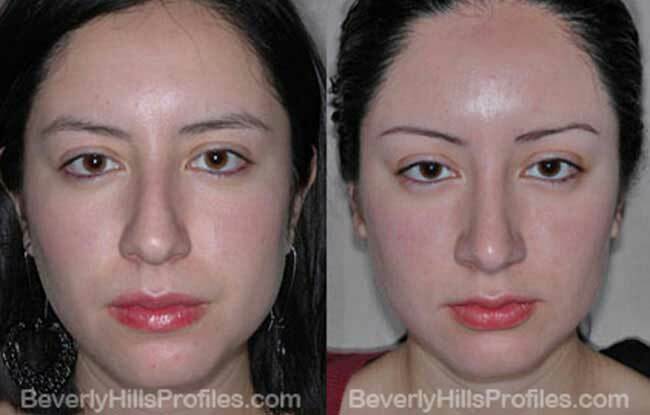 Her rhinoplasty involved softening her look and removing the convexity on the bridge that made her tip look downturned. 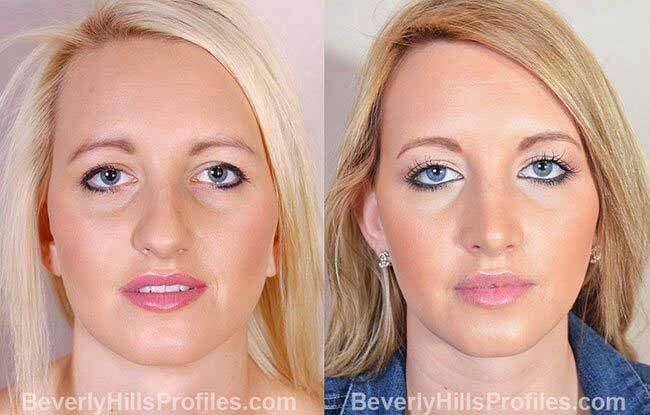 Fat transfer under the eyes has stood the test of time and really helped to reduce her under eye hollows to noticeably brighten her appearance. 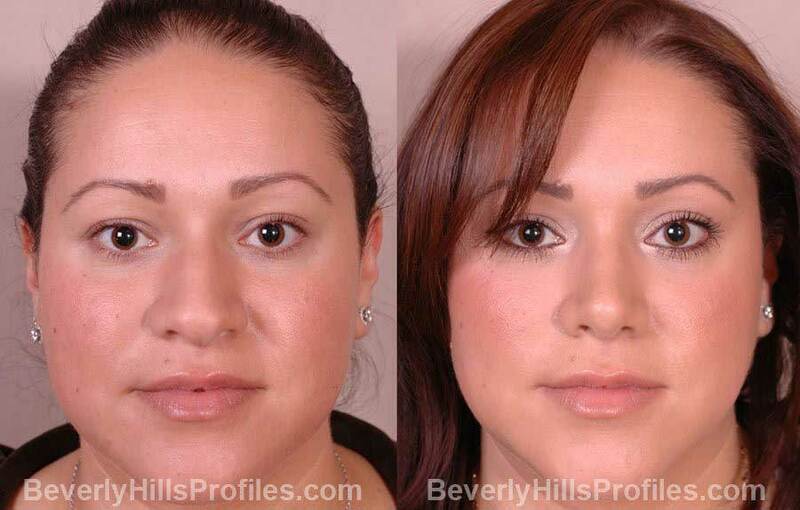 Case 97: Having a rhinoplasty along with a facelift can be absolutely transformative. 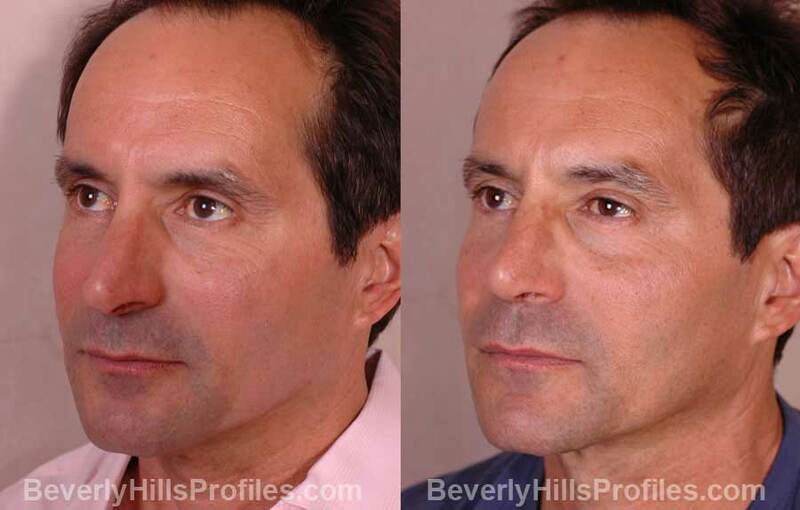 By addressing aging changes in the lower face and nose, such as tip droop and tip/nostril widening, a truly beautiful natural rejuvenation can be accomplished.